Where Isel and Drau combine their glacier-fed water, where mountain lovers can hardly fight the call of the Dolomites, the Grossglockner and the Großvenediger as well as where year after year, a vast number of teams go to their limits and beyond at the Red Bull Dolomitenmann - there exactly is where we want to find routes and trails for us and our beloved bikes. 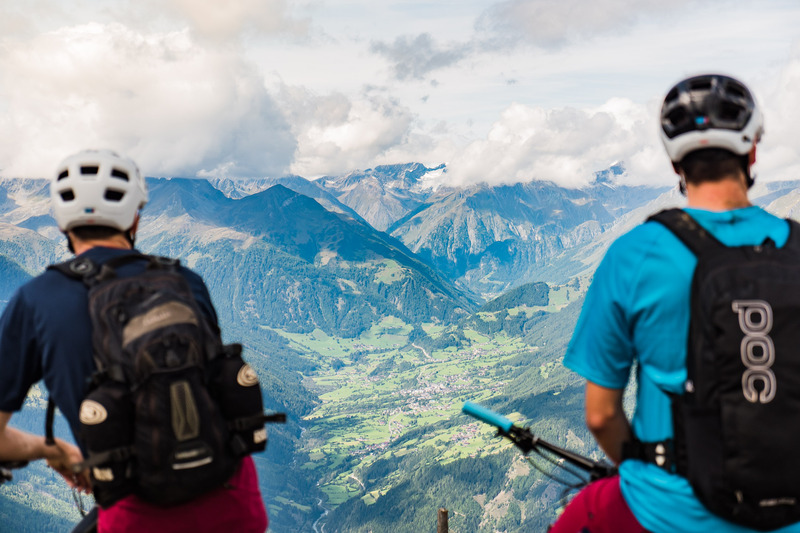 East Tyrol and the city of Lienz are still an insider tip among touring bikers. Surprising actually, as 266 (!) 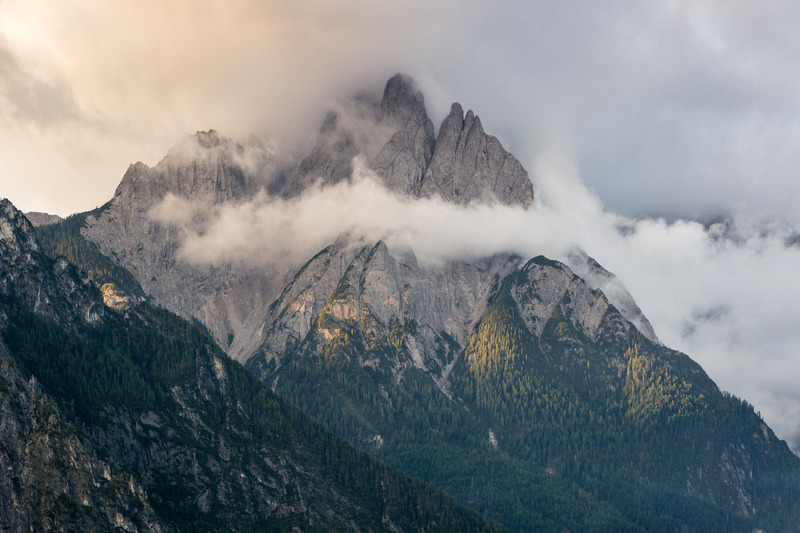 peaks are rising past the three thousand-meter-mark there that are home to an official trail network of 600 kilometers in front of an impressive mountain panorama. 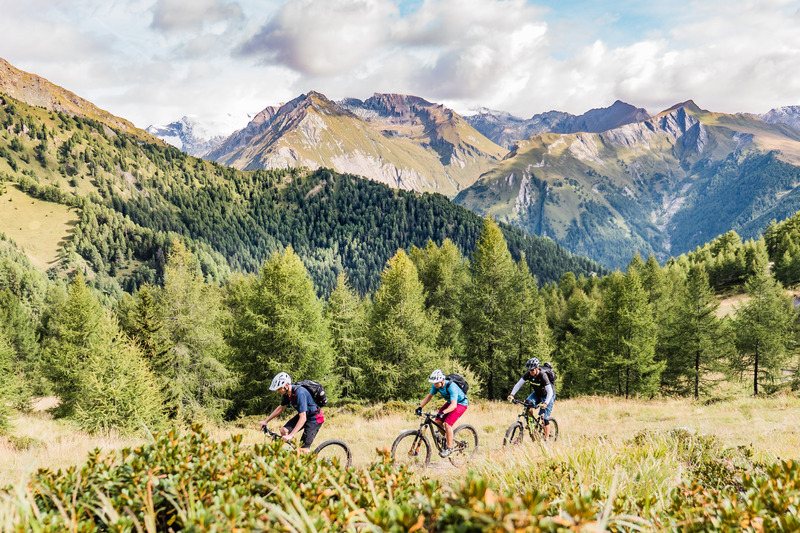 Not to mention all of the hidden trail gems; or would you assume that marathon-ace Alban Lakata or whizz-kid Fabio Wibmer - both children of East Tyrol - have developed their skills on steamrolled fire roads. 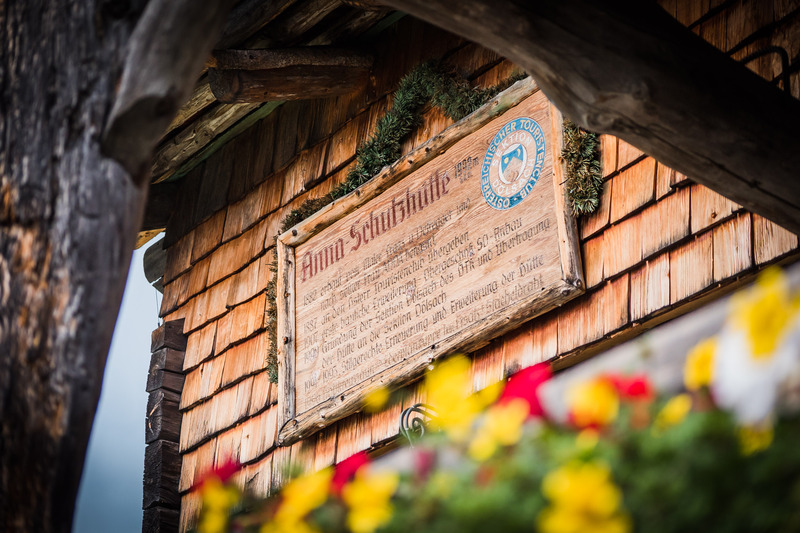 Lodged in the capital Lienz, we take off on a first reconnaissance mission on the first day to the Anna mountain hut, located at the Ederplan. 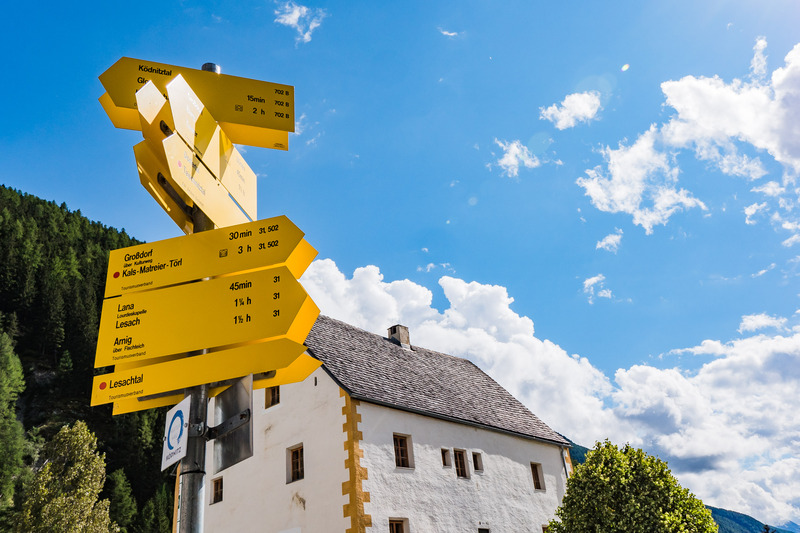 The route is part of the Four Huts Tour that encircles the city of Lienz counter-clockwise across the foothills of the Schober group, Deferegger Alps and Lientzer Dolomites. 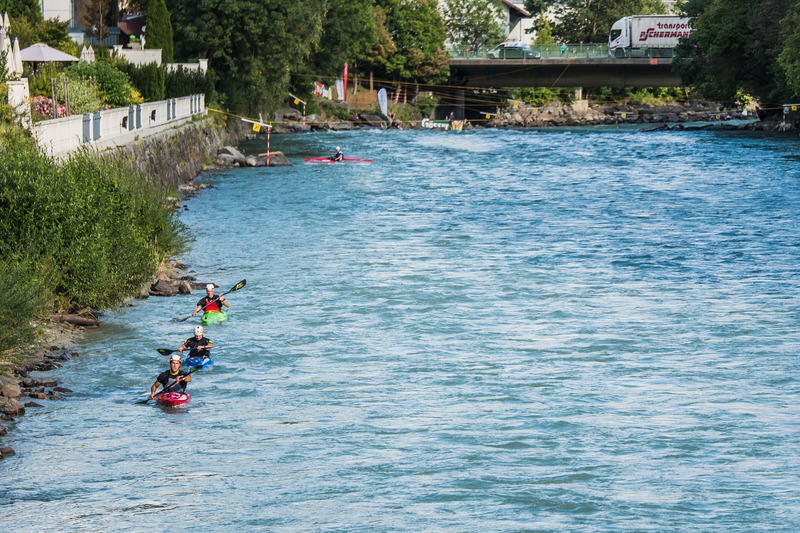 Thanks to the 'scenic route' in our navigation system and therefore our somewhat late arrival in East Tyrol, we're rolling downstream along the Drau out of Lienz' city area, all the way to Dölsach, with lights in our backpacks, assuming that we might not get back to our headquarters before dark. 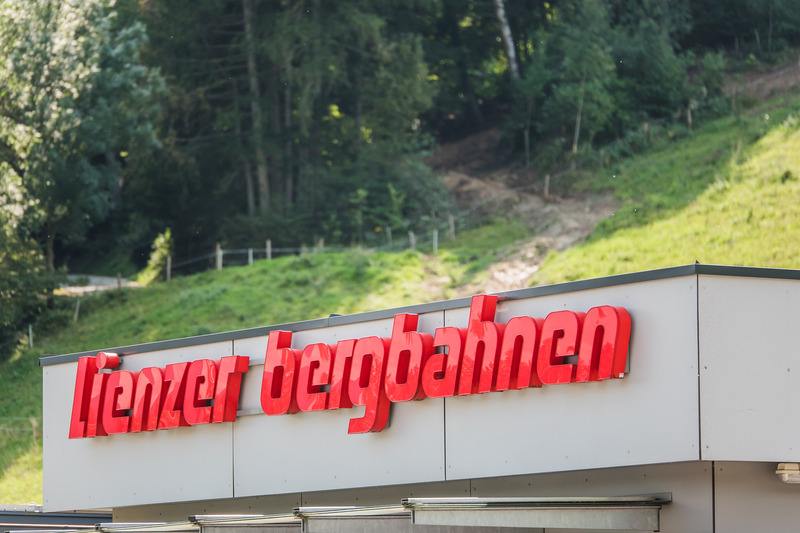 Passing the swimming bath, fruit trees and the schnapps distillery Kuenz along an asphalt ramp, a short descent towards Gödnach quickly follows. 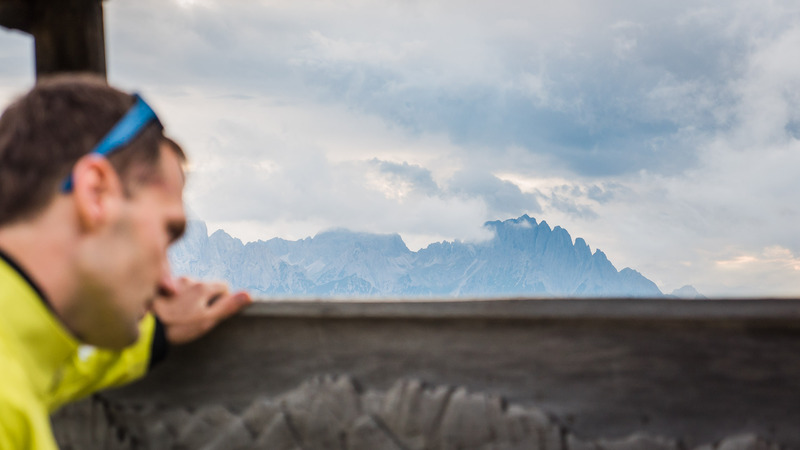 This is also the last opportunity to relax before tackling the 1,300 meters in altitude towering up in front of us. Gödnach - last opportunity to relax before tackling the 1,300 meters in altitude towering up in front of us. From Görtschach on, an asphalted access road rises steeply against the mountain but soon tapers out and transforms into a well-maintained fire road behind a turnpike. 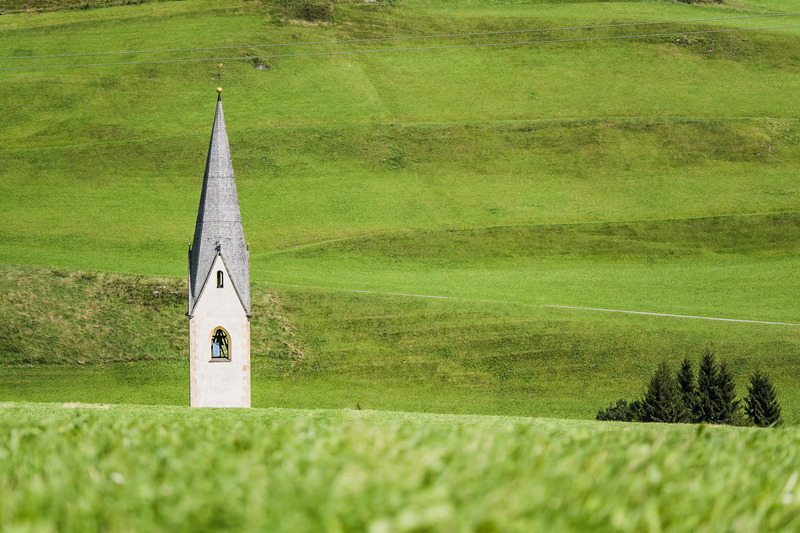 While we're slowly progressing upwards through the forest, passing stoically grazing cows, uninterrupted views allow for deeper glimpses across the valley floor of Lienz and into the Puster- and Isel valley. 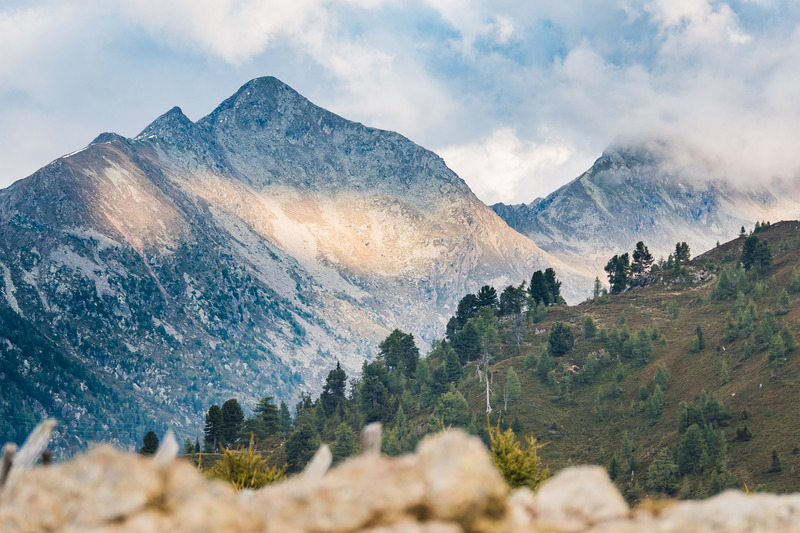 Just as the tiring covered altitude and rising hunger slowly call for attention, the surrounding landscape transforms more and more into alpine pastures and the path before us rises steeply again. Heavy rainfalls and consequently forming temporary riverbeds left behind deep ruts and coarse rocks. To keep the bars straight and the front wheel on the ground becomes more and more of a challenge. While the capacity of enthusiastically selected single-chainring gearing gets to its limits, it surely isn't a shame conquering the remaining 150 meters in altitude walking alongside one's bike. Besides, that way it's easier to take in the landscape with its flora and fauna in detail. 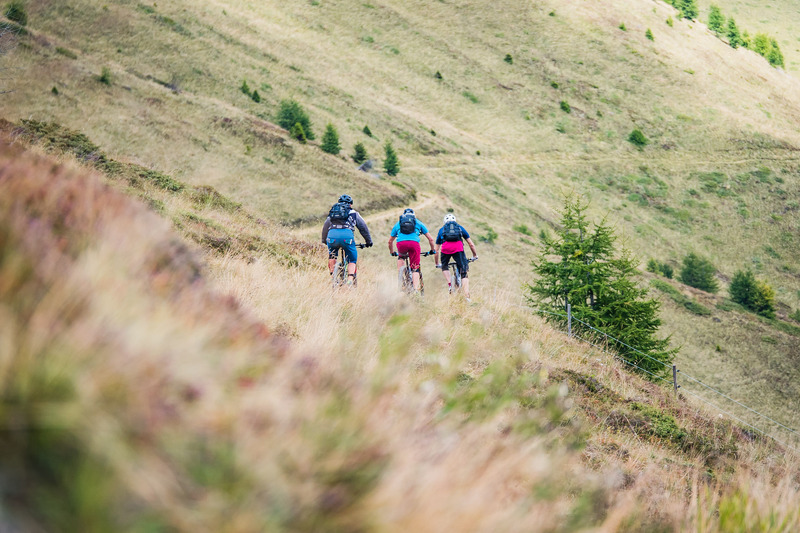 When squinting slightly, and trying to persuade the legs for another turn of the cranks while hyperventilating heavily, it's easy to loose sight for nature and the surroundings in general. 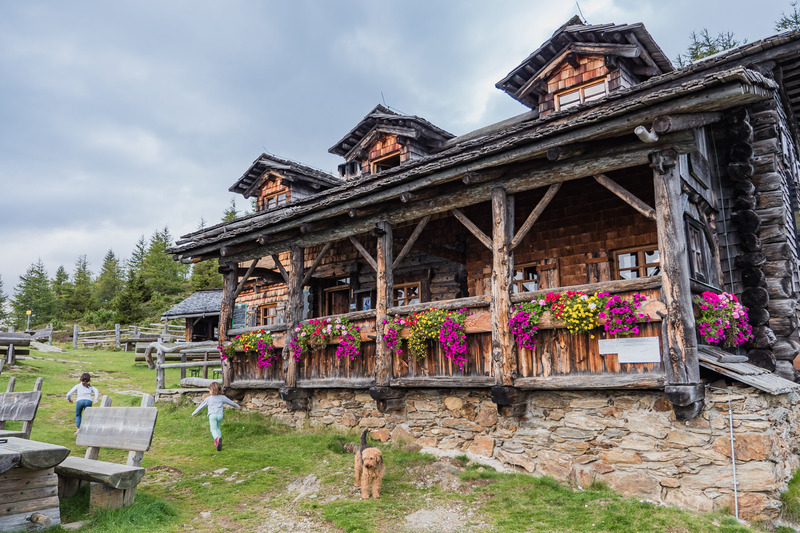 A few small mountain huts announce that the Anna mountain hut is near. 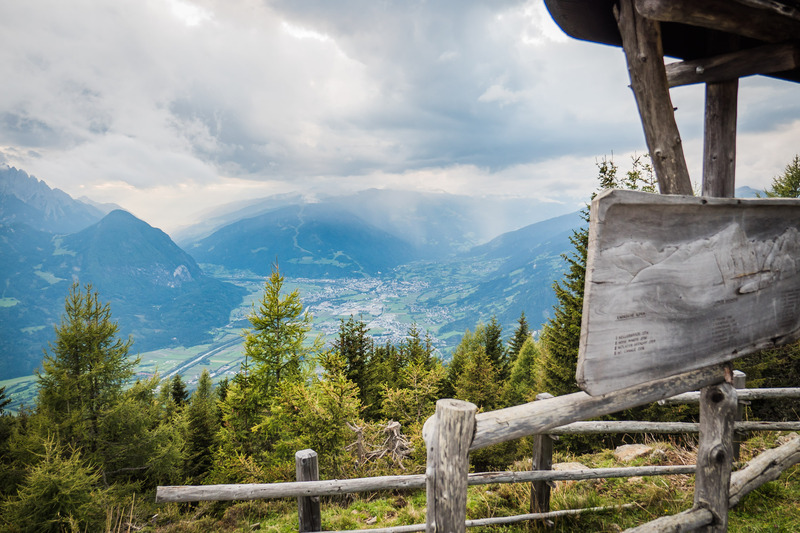 But before we reach the place - where painter Franz von Defregger has built a hut for shelter for his beloved Anna in 1882 - we climb the wooden fence and shoulder our bikes to climb towards the summit of the Ederplan. 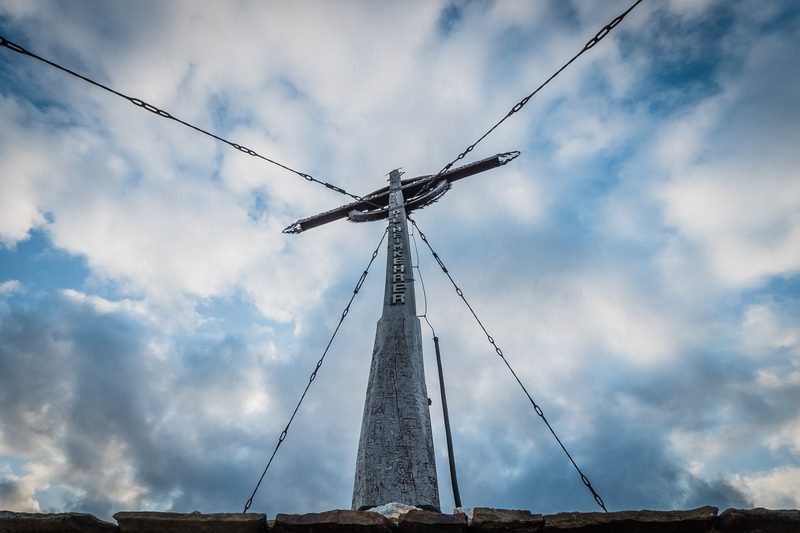 With the summit cross always in view, the steep trail leads to the highest point of the tour at 2,062 meters within a few minutes. 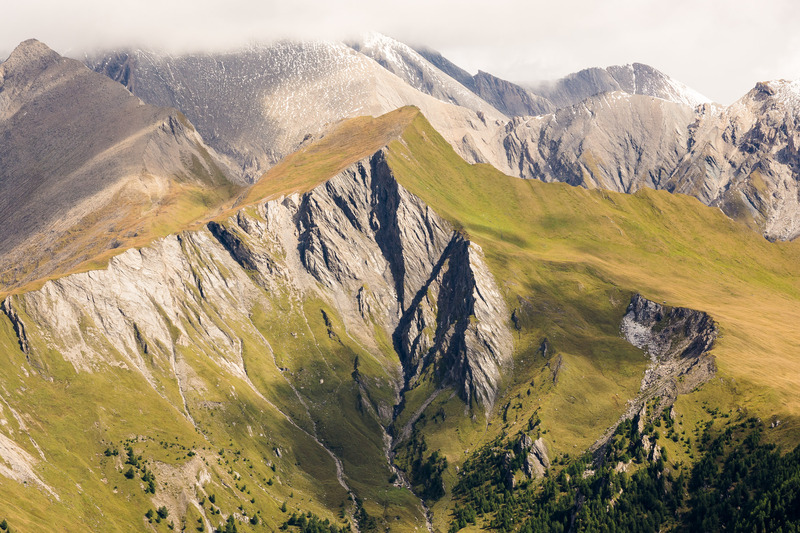 We're standing right at the border to the national park Hohe Tauern with the Venediger group, Grossglockner and Lienzer Dolomites in view. In the distance, the Triglav is gleaming in the last sunbeams of the day. To our feet, the first lights in Lienz are being switched on, as we're dancing down the short trail towards the hut. 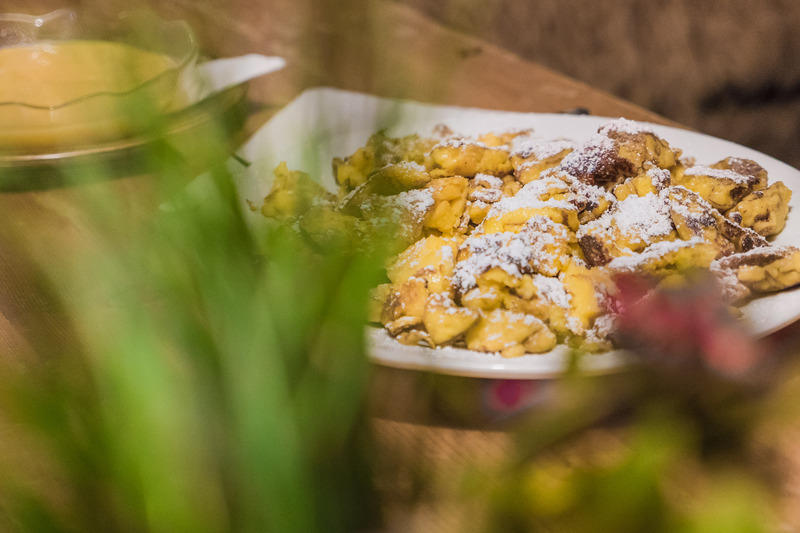 Dishes of wild game – the brother of the innkeeper's wife personally goes on the hunt to deliver stag sausage, deer liver dumpling soup and Co. – and Kaiserschmarren at the neighbor's table together with our noses, help with our decision-making. 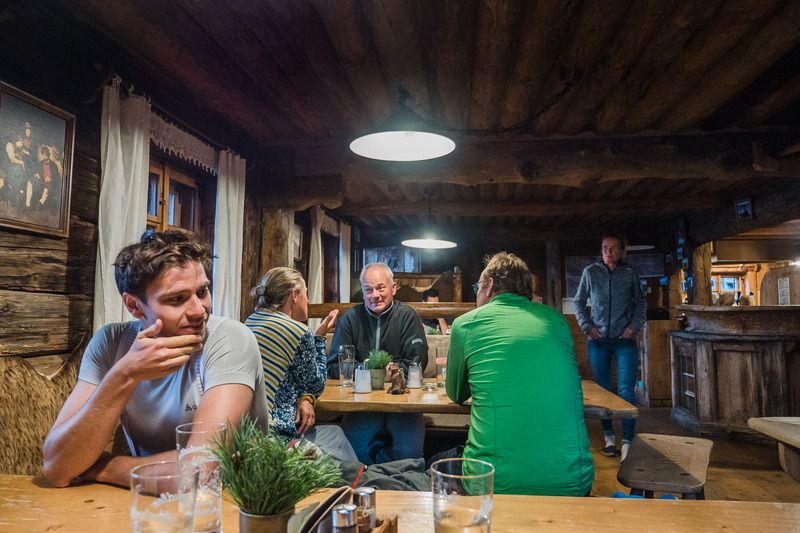 Of course we could have also spent the night at the hospitable hut, let the evening fade out cozily with a couple of schnapps-shooters and simply enjoyed the hard worked for views and blissful quiet. Still, we opt to mount our emergency lighting, slip into our warming jackets and make our way out into the dusk. 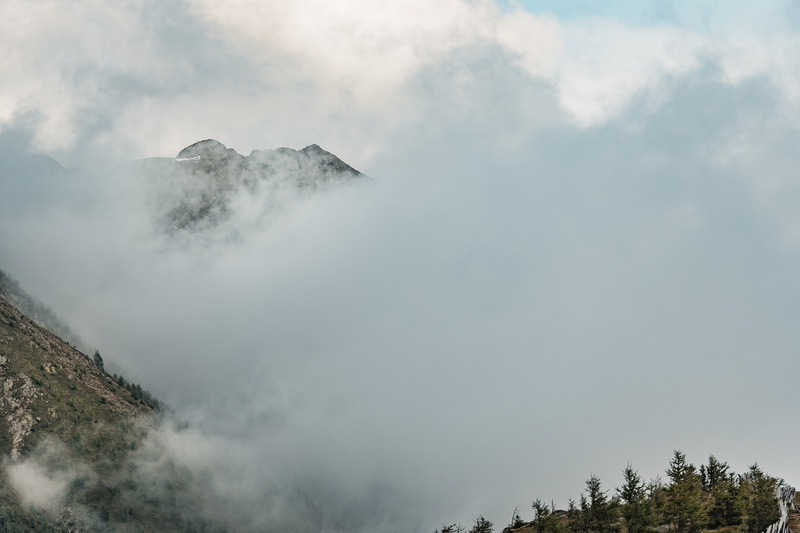 Locals have beforehand revealed the existence of hidden trails leading down towards the valley - not exactly legal treats with not enough light to search for on this day anyway. Therefore our little group goes back down the way we came up on the official route. With the last remains of light we get spit out alongside the Drau, which we swim back in the beams of our lights toward the Goldener Fisch (Golden Fish), our headquarter during these days. 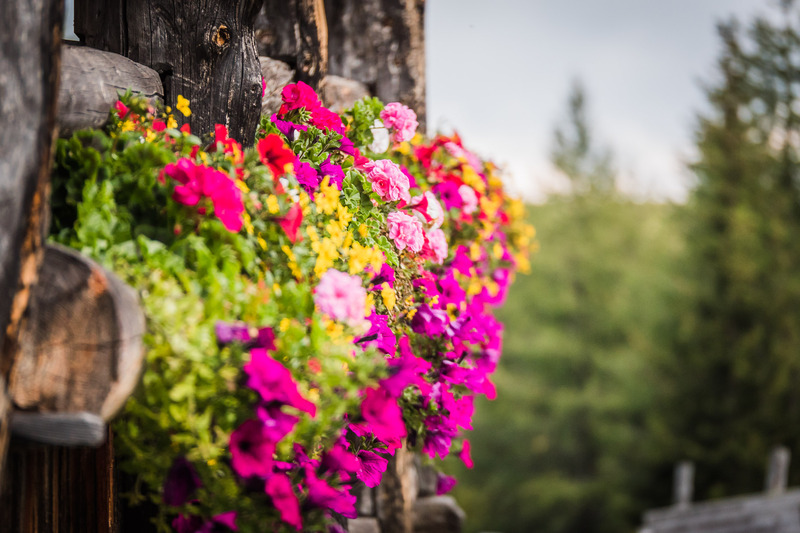 Yes, even in sunny regions like this, rain showers can be heavy and unexpected. 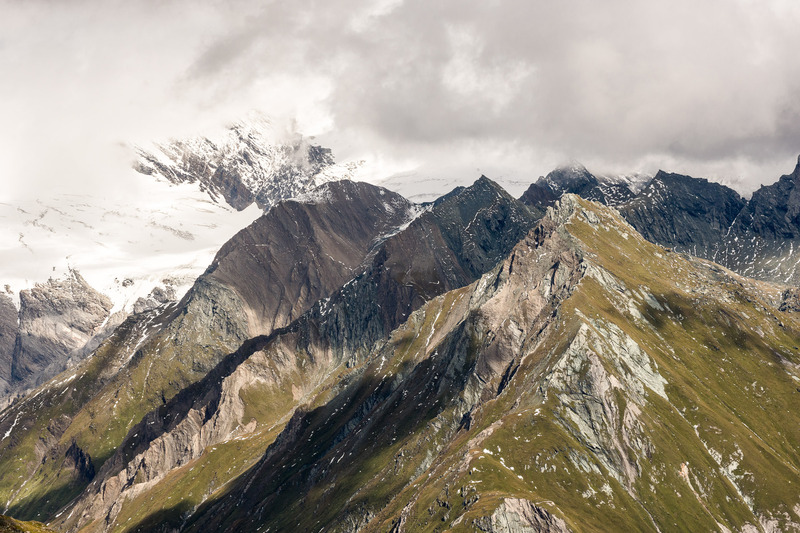 Knowing fully well, that we would do our laps in a few short hours in the shadow of the Glockner massif, our backpacks have long been packed as my smart phone is playing its annoying wake up-tune. Struggling with the last bite of breakfast we're heading out to drive up to the village of Kals with our car. We have scheduled a meeting with Gunnar Kopf. 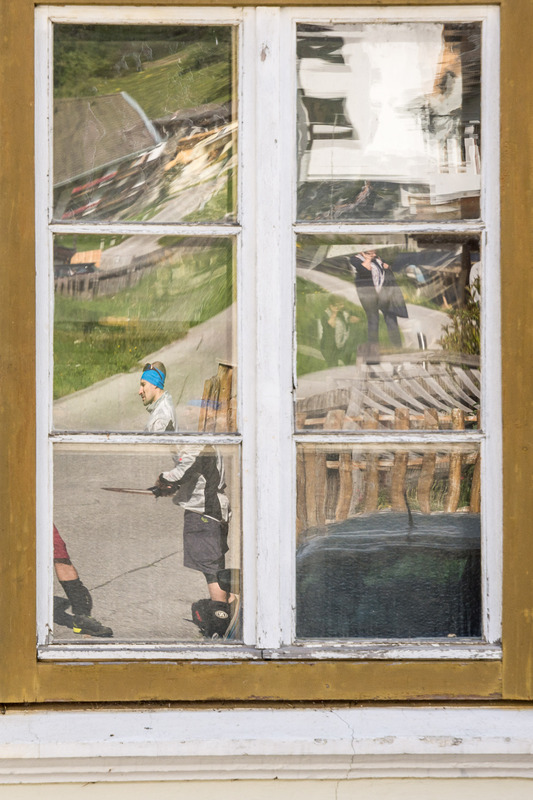 The Kals native actually earns his crust in Innsbruck; but come summer he keeps getting drawn back to his hometown. 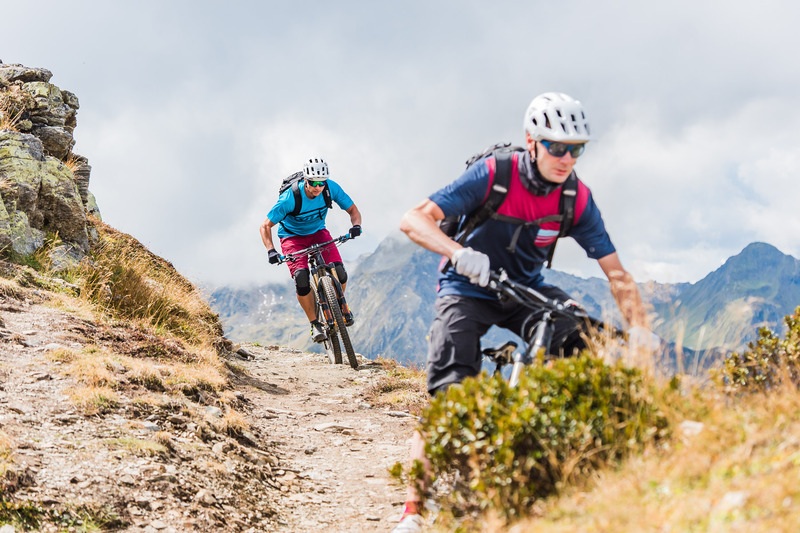 Together with Glockner Adventures he is offering bike tours, hike & bike adventures or SUP-excursions. And right there, at the foot of the Cimaross, he is also involved in the development of a trail park. As Gunnar welcomes us at the parking lot of the Kals lift valley station, Austria's highest peak slowly begins to cover itself in cotton. Afraid, that we'd have to return home without photo proof, we decide to split our group without further ado. Photo artist and camera heads to the top of the trail entry via gondola to save some time and snap some scenic pictures, writer and research team push the pedals to the top with our local guide. 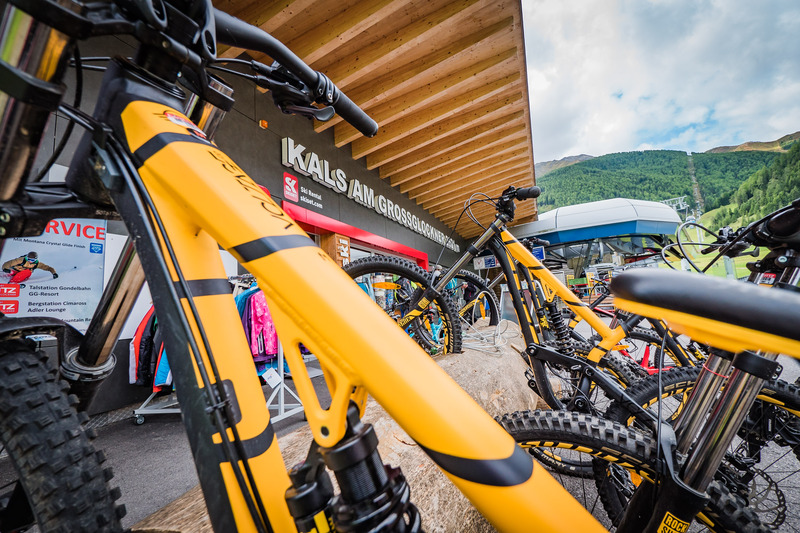 Pedaling, gondola riding or both - many paths lead to happiness in Kals. 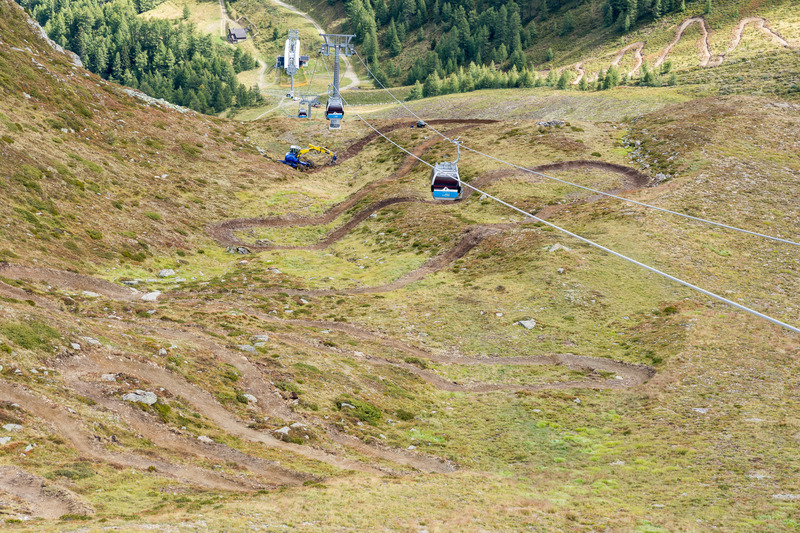 For the moment, we're ignoring the Gornerwaldtrail, move behind the cattle fence and keep riding to the middle station. 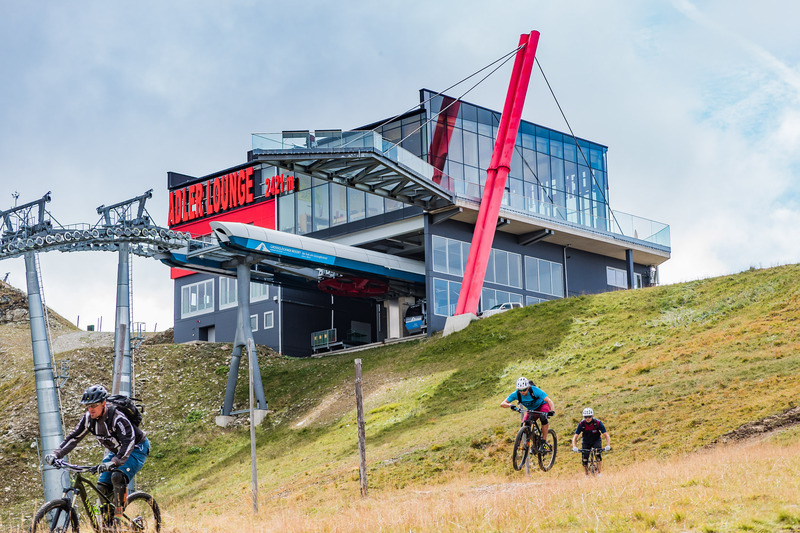 Even though there are numerous ridable passages, we end up shouldering our bike a few meters above the lift station. 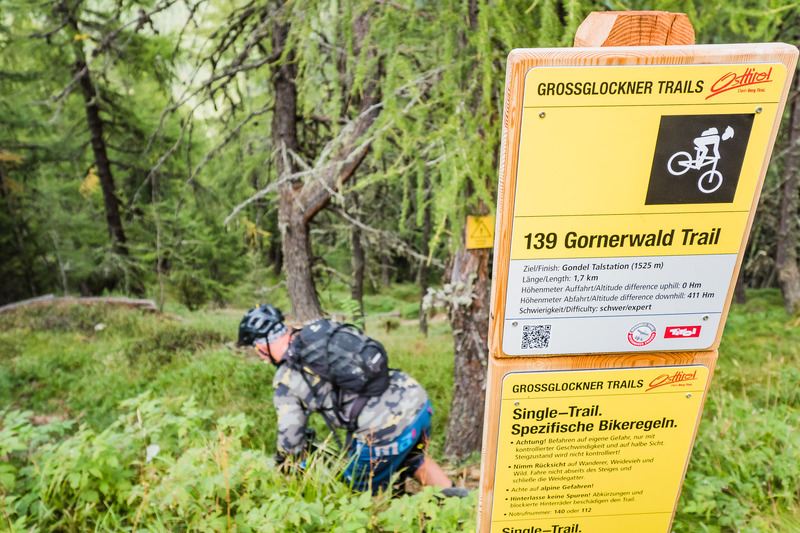 The fire road and mountain bike tour only reaches as far as the Grönerwaldtrail, at least for the moment. 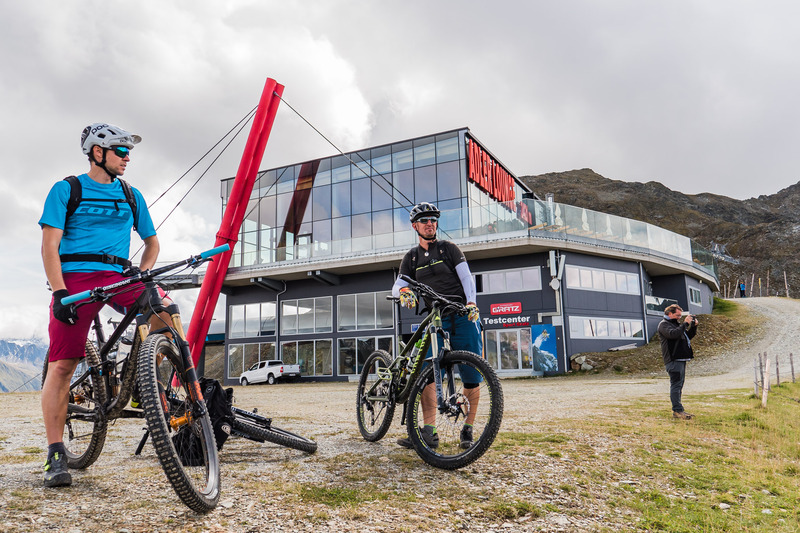 To get all the way to the Adler Lounge, which marks the entry to the Family Trail that is currently under development, there are currently only two options: to carry the bikes or float effortlessly up by gondola. A ridable variant as an extension of the existing route is planned. So it happens that we are stomping ahead at a steady pace by foot. First, moderately steep past bleating sheep, but in opposite direction of our goal, later sharply upwards and in direct line to the Kals-Matreier Törl at 2,207 meters above sea level. If we wouldn't have a target in mind, the Kals-Matreier Törl hut would indeed be an inviting option for a stop with its appearance radiating a connection to the past. 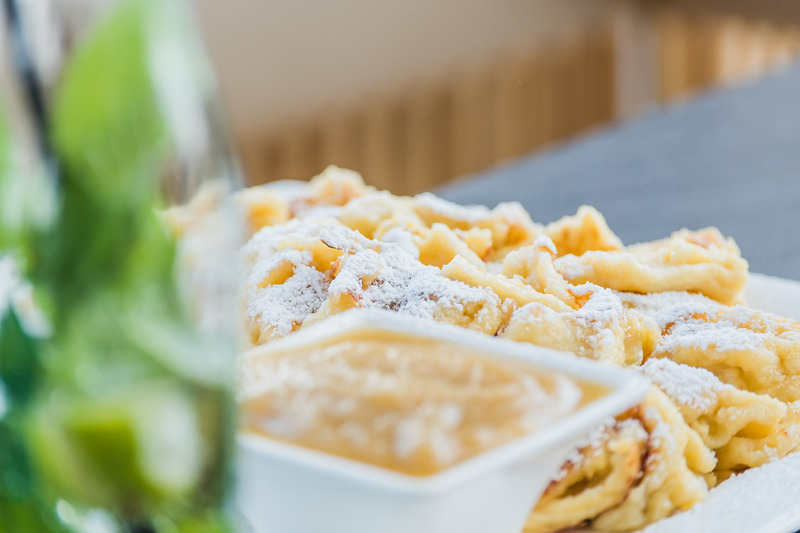 From the sun terrace of the Adler Lounge, but also through the generous glass front of the restaurant or - for those free from giddiness - from the small footbridge on the north eastern side pointing towards the Grossglockner, you can watch a good 60 of those said three-thousander summits while munching on a gourmet meal. To the west opens up the view down towards Matrei. 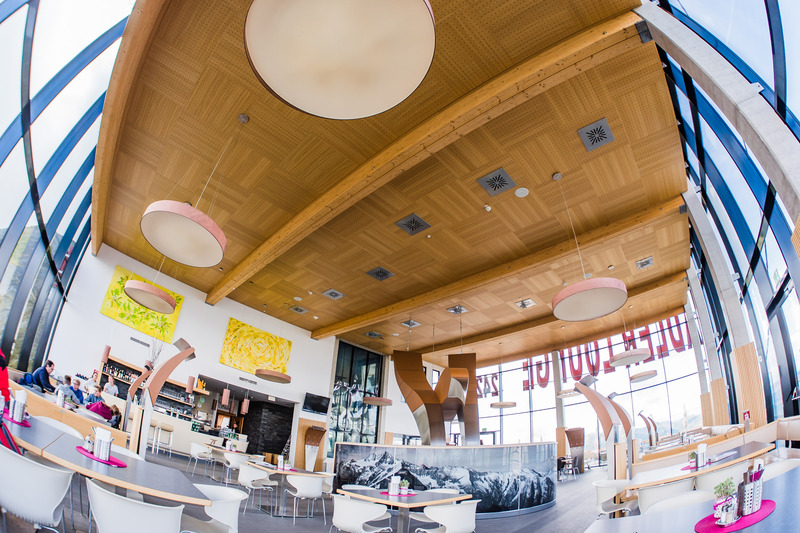 Thanks to the panorama and the modern architecture, you could almost assume to dine in dinner jacket and cheeky cocktail dress. Great, that our sweaty bike gear teaches us better. 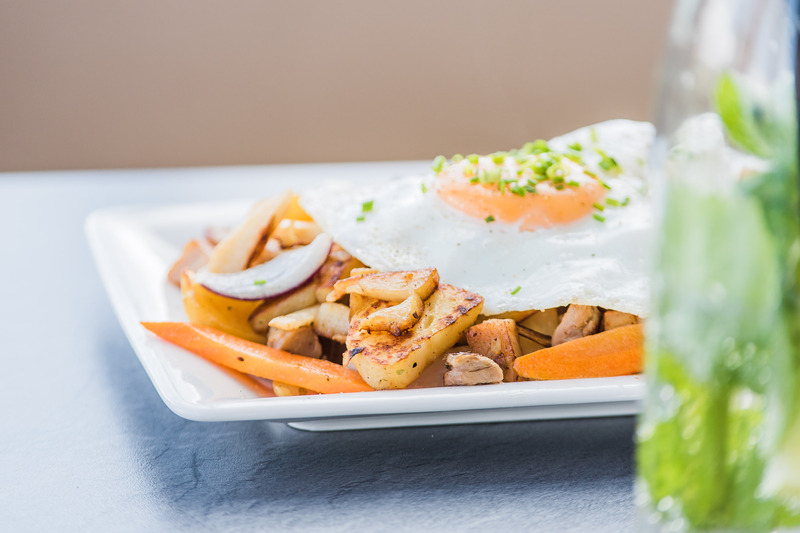 Highly recommendable: again, the Kaiserschmarren, but also the home made lime-mint lemonade and the lovingly presented meat dishes can hold their own. From the inside we watch the excavator through the window, as it works diligently on the Flowtrail that's to open in spring of 2018. Head of the project is the Kals native Robert Trenkwalder, the snaking lines leading towards the middle station flowed from the pen of long-time Vertrider 'Picco' Piccolruaz, though. Starting right below the Cimaross, on the door step of our pit stop, are about 400 meters of altitude drop along 40 tightly spaced berms. 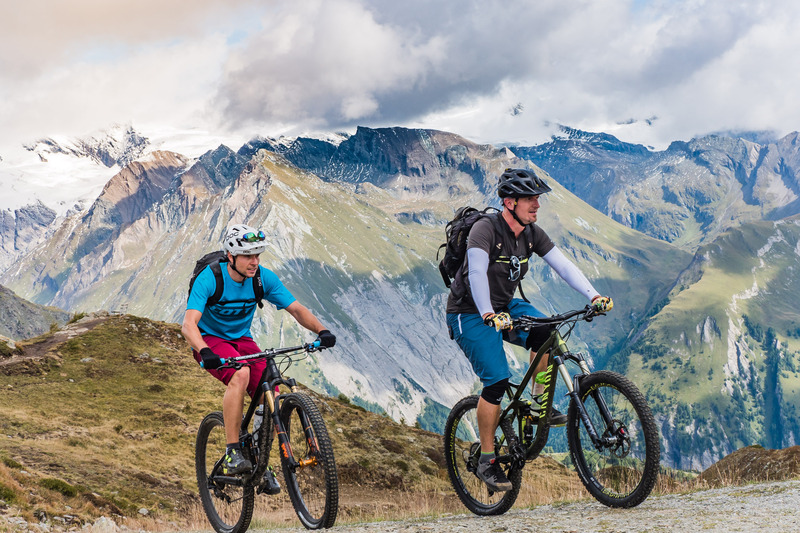 Intended as a fun trail for all levels of bikers, above the treeline and with the Glockner, at least peripherally, firmly in sight. We can only catch a hint of the roller coaster feeling that's to be expected on the way to the middle station during our first on-site inspection on the first few meters of finished trail. Before the trail can really unfold its potential, we have to pick another option due to its work-in-progress status. 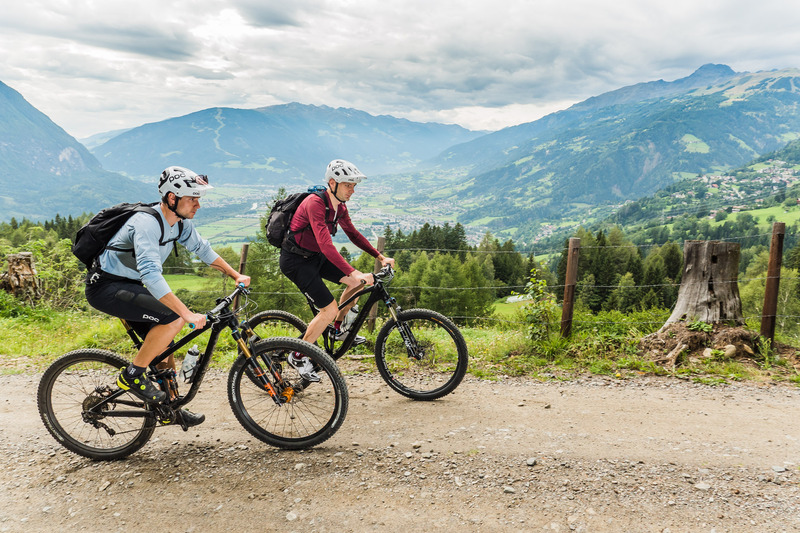 Together with the Gornerwaldtrail, which is marked with a black level of difficulty and therefore recommended for experienced pilots, and its 411 meters of elevation loss, including the short connecting part, you're looking at a combined number of 900 meters in elevation down the hill. With the option of lift or pedal accessed ascent, you should be entertained for a while. Same goes for the Gronerwaldtrail. A little bit hidden but nicely signposted, its entry is already intended to sort the wheat from the chaff. 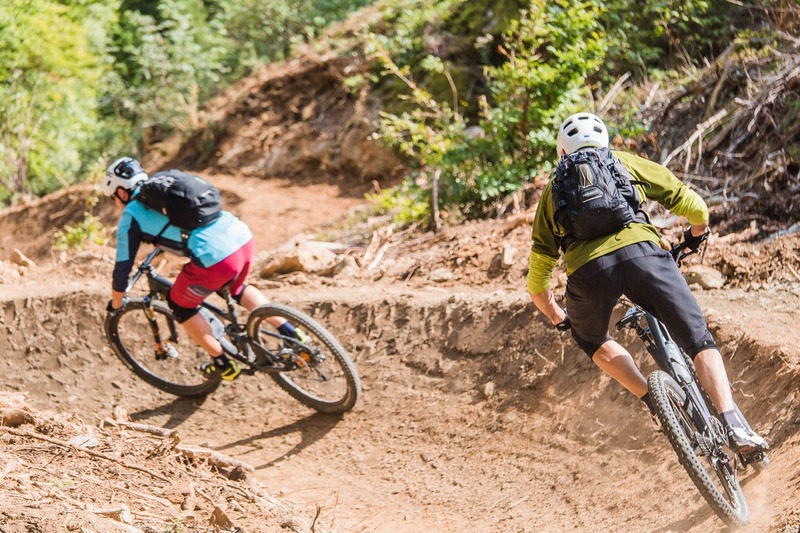 Those that can master the 40 cm tall drop should be able to deal with the rest of the trail. At least that's what we think the thought process behind the entry might have been intended for. Chicken line? Negative. But there's always the option of climbing down. 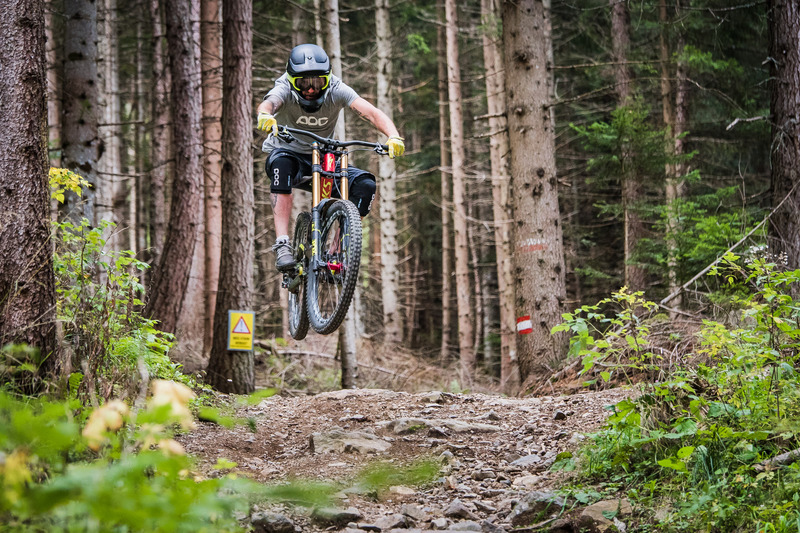 Especially the upper section of the recently finished downhill is interspersed with jumps and drops - at those points with bypasses that are easy to spot. 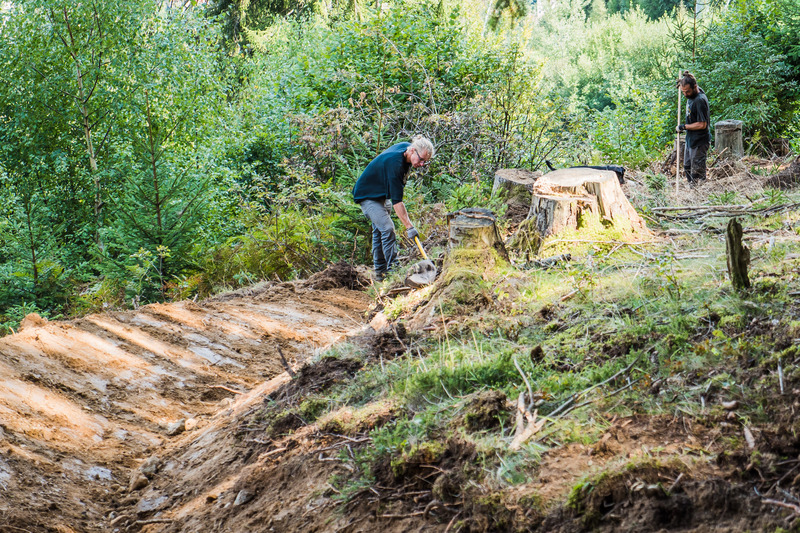 Rather steep throughout, the existing natural trail has been expanded by hand and enhanced with a bunch of berms. Only a few roots stray onto the freshly groomed Gornerwaldtrail. 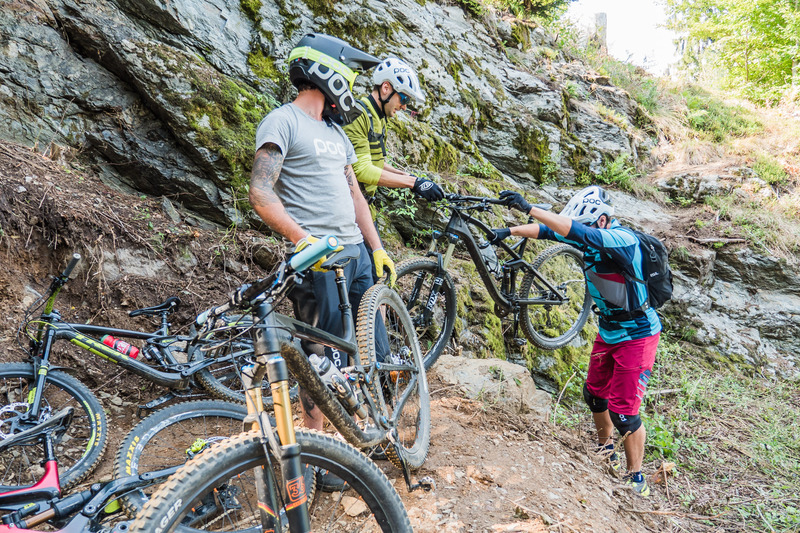 Rocky sections are also limited (for now) but we're curious about how the trail will transform after a full bike season. 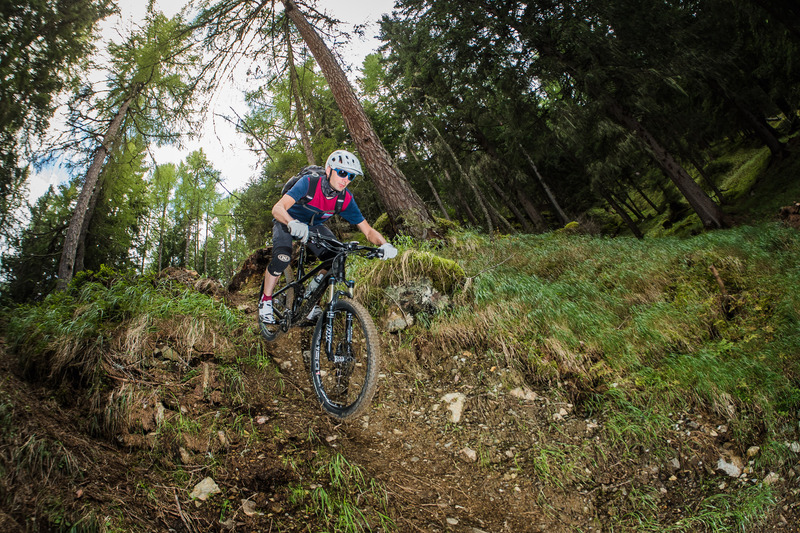 Beyond a short steep section - keep your fingers off the brakes - all artificial elements are out of the picture and the natural characteristics of the trail come into full play. 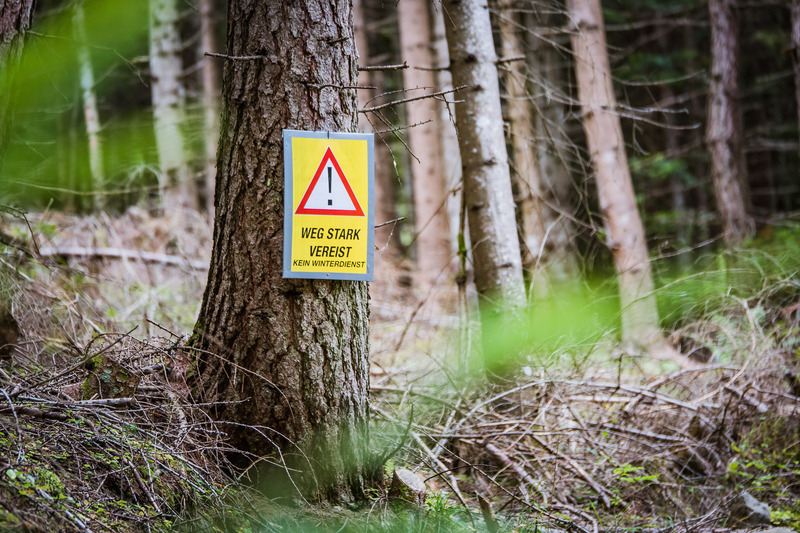 A few meters above the Temblerhof we are spit back out onto the fire road. 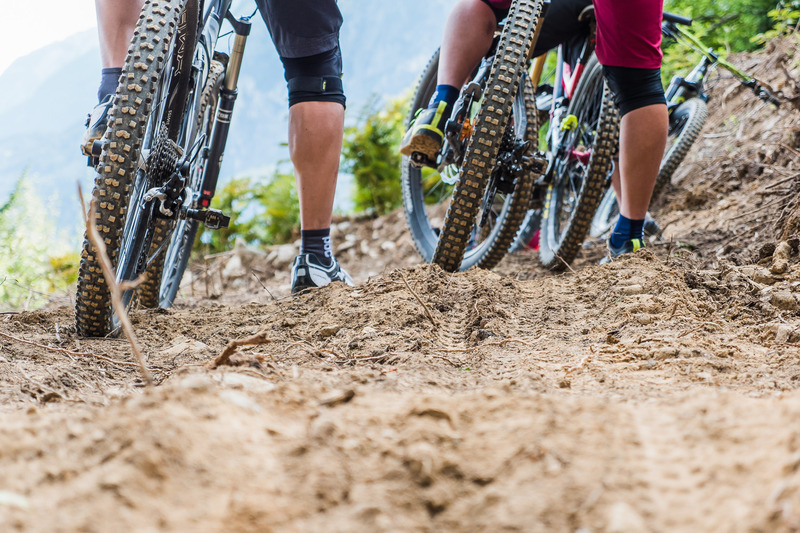 Here, as we are told by Gunnar while rolling along towards the valley station, a small practice trail is planned to cater to up-and-coming and beginner riders or simply act as an alternative to riding the wide gravel road. Things are happening in Kals. 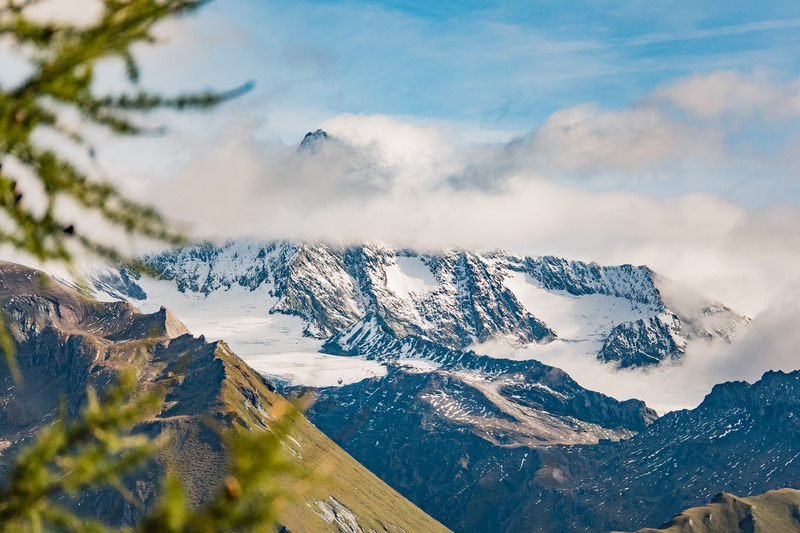 We're looking forward to how the courses in and around the village at the Grossglockner develop, come spring time. 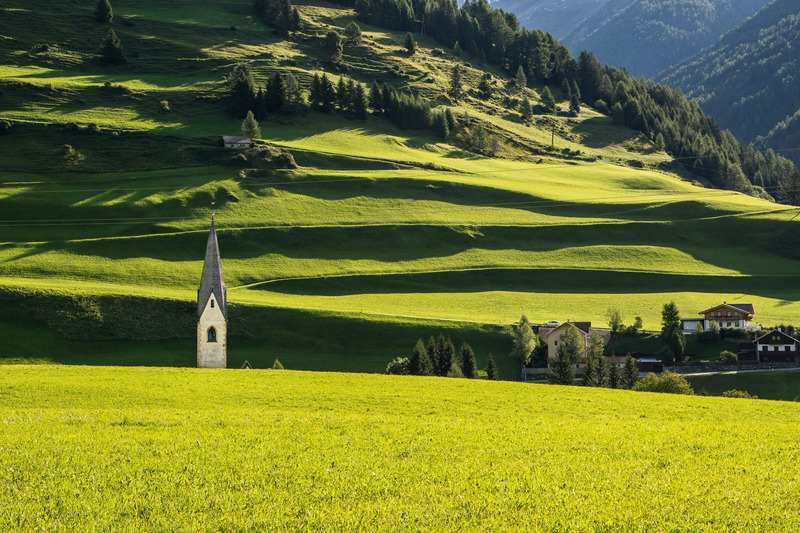 But shovels are not only swung in the vicinity of Lienz. Within the capital itself the tracks are laid down to start official trail constructions. 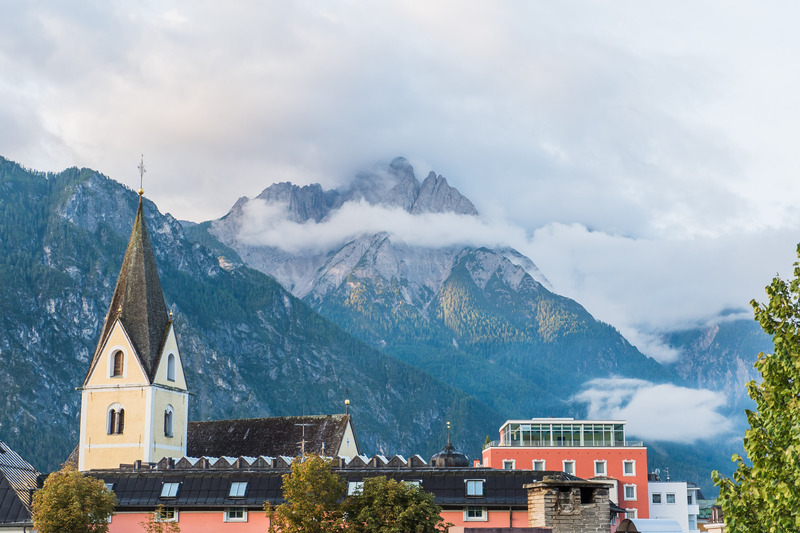 At the city limits of Lienz, right at the valley station of the Hochsteinbahn we have an appointment with Renè Unterwurzacher. 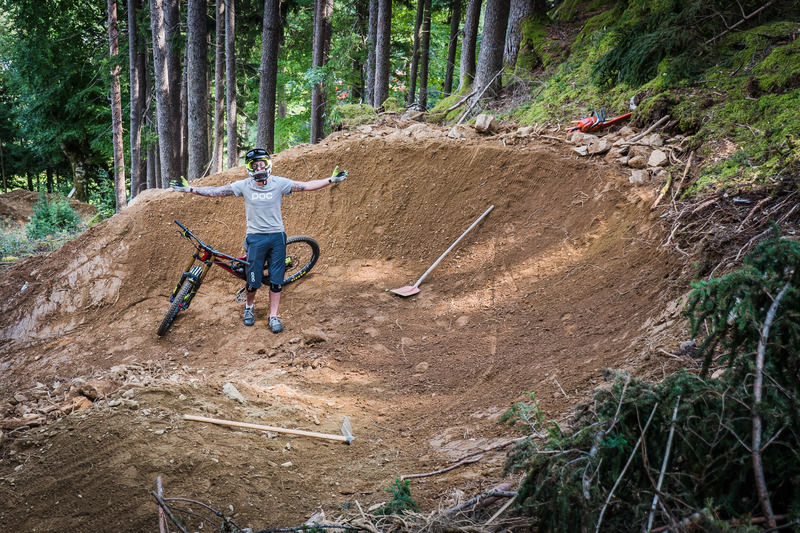 Here, not far from the middle-aged city center, we more or less become witness to the birth of a bike park. 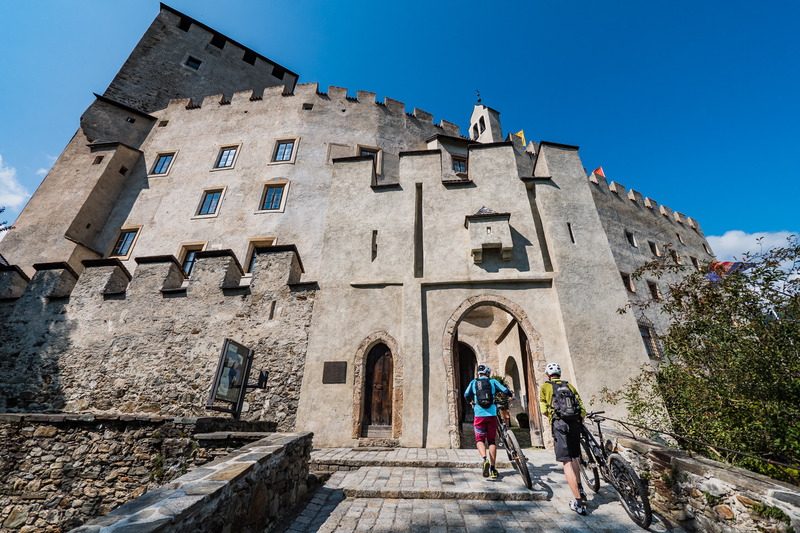 With the impressive Castle Bruck at our feet, the 2,056 meter high Hochstein is keeping watch over the city and acting as the Lienzers' local ski mountain and battleground for bikers and paragliders during the Red Bull Dolomitenmann. 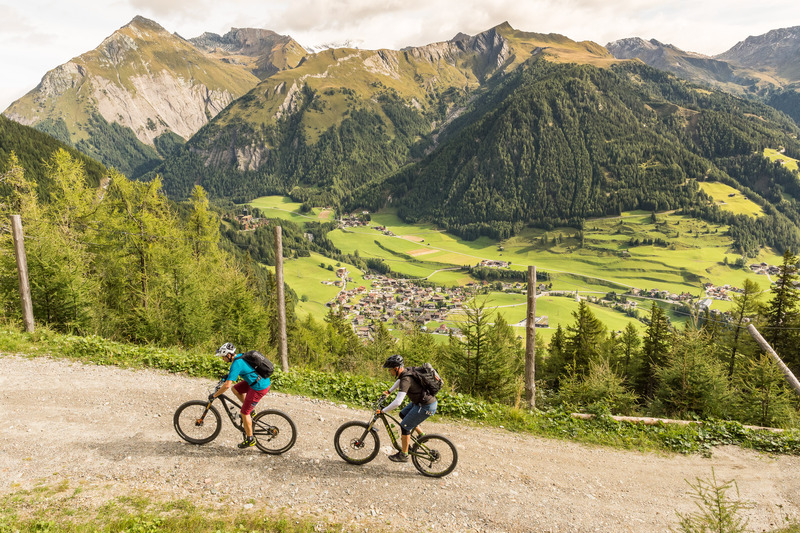 For years Renè has been fighting for a legal singletrail and has even founded the cycling club Ride Free East Tyrol. With his employer Dolomite Bike fully supporting his dream, tourism, lift corporations and landowners are finally on board and construction is underway! During our visit at the beginning of September 2017 construction is in full swing – it's a work in progress, so to say. However, the first fruits of labor should be ready for the first bike trips in the new season. In the meantime the head of development takes us on a subtle tour at the 'construction site'. Down at the valley station a pumptrack is planned to be taken down during every winter and rebuilt when the ski season ends. Renè is also dreaming of a bag-jump. Down here, apart from a new hotel, a bike center for rentals, sale and guiding is in the making. 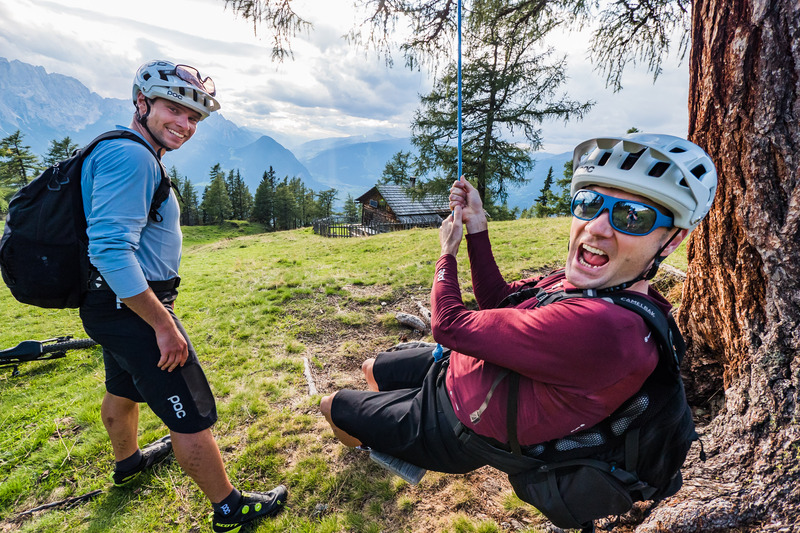 A friendly lift attendant is connecting our bikes' saddles to the seats of the Schlossbergbahn Hochstein 1. During the way to the top we have a little chat with Renè about the potential of the region. 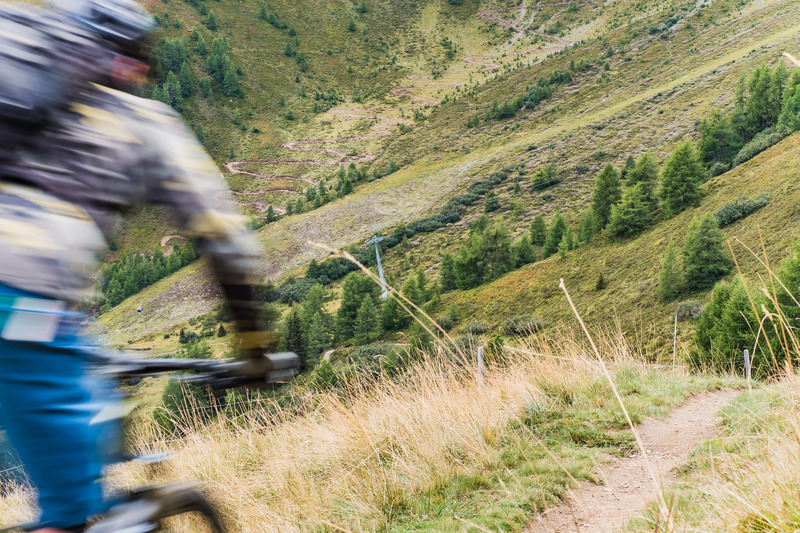 About the many possibilities to develop and access more trails. 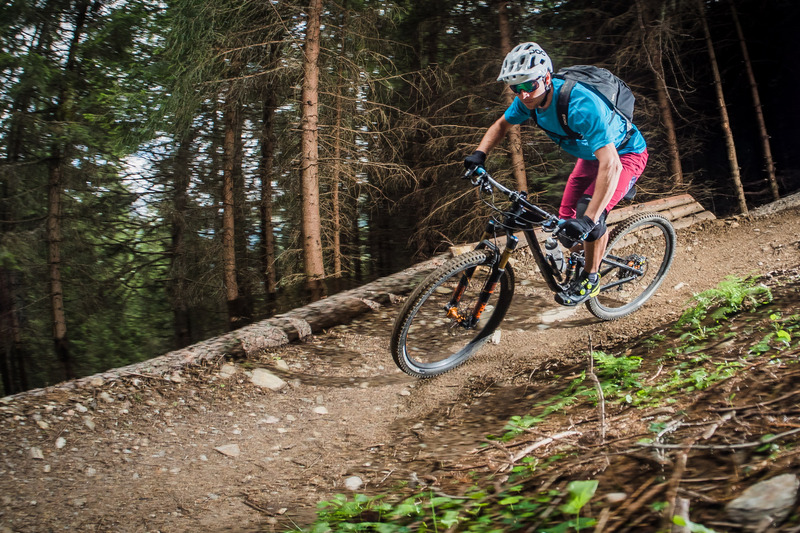 About the long bike season in and around Lienz and his own passion for the sport. About how much he loves speed and big jumps, but also about what beginners and the next generation of riders need and want. 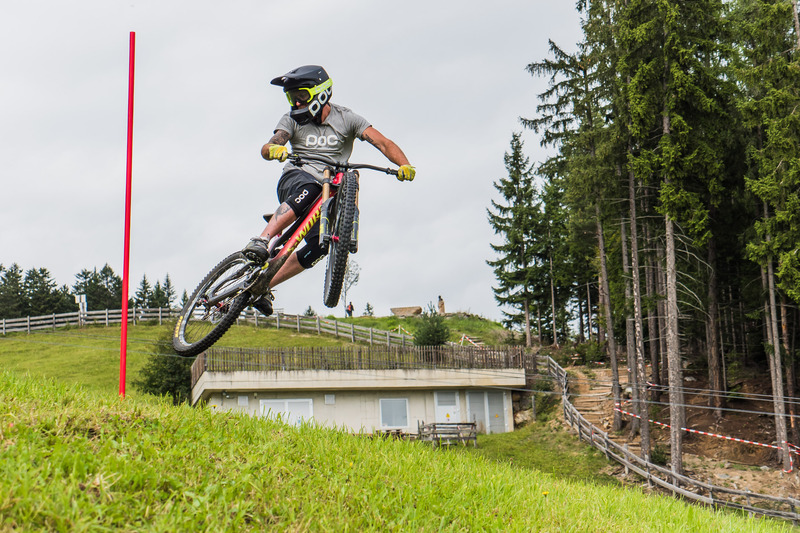 The project Bike Park Lienz Hochstein looks to be well thought-out. At the Moosalm our bikes are already waiting for their owners. 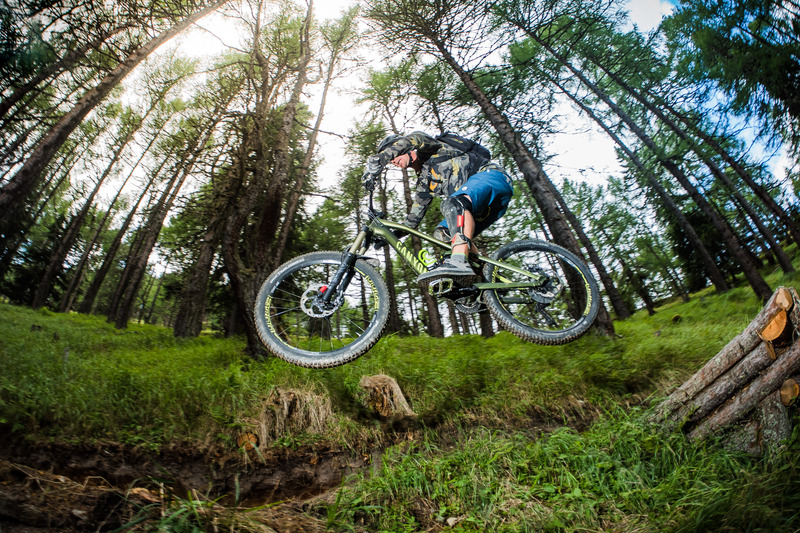 The Lakata-Trail that takes off from there is scheduled to be finalized at the end of 2017 and therefore the first piece of the puzzle in the new bike park. Lakata? Yes, the multiple marathon champion Alban Lakata is honored in his home state with a trail being named after him. First, though, Renè wants to take us even higher up the mountain. 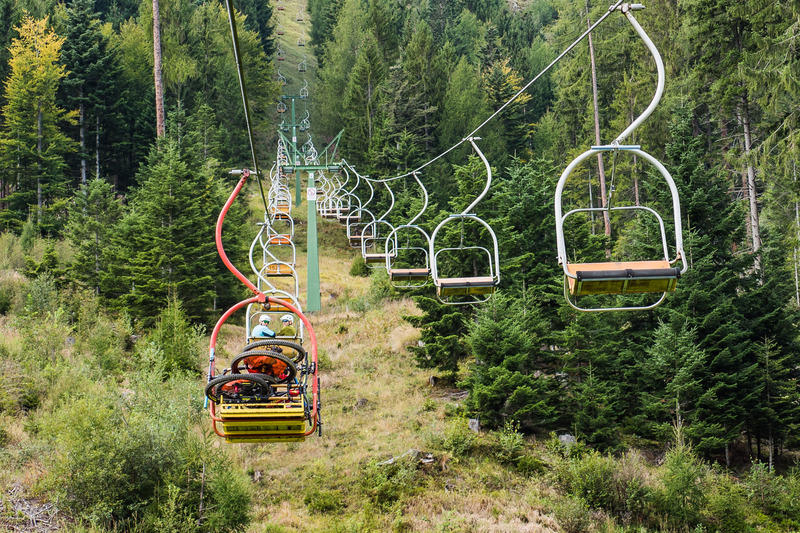 An old double-chairlift is lifting us higher to the Sternalm. The hooks for bike transportation are part of a later stage of expansion. 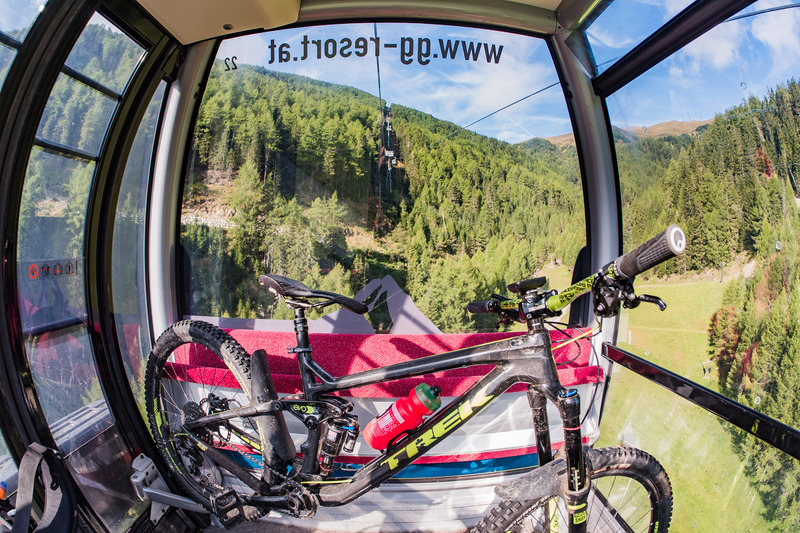 Meanwhile, there is only an exception for our bikes to be carried in the transport gondola. 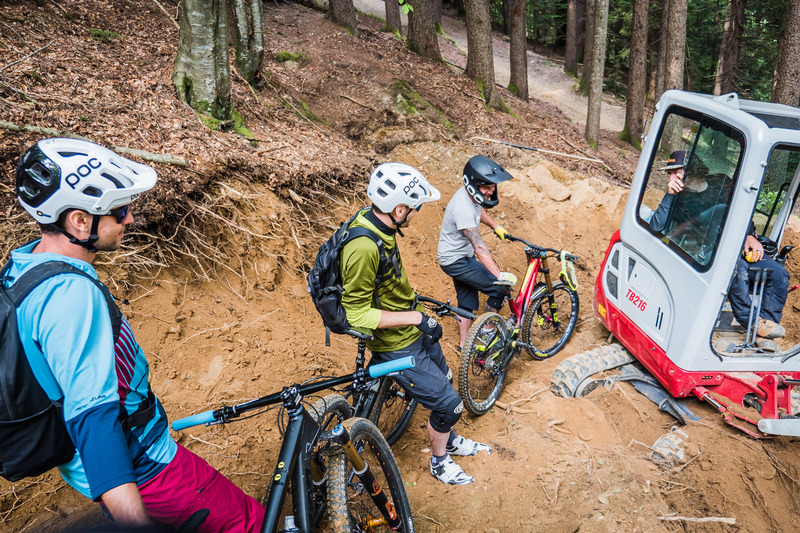 With the city of Lienz at our backs and the mixed forest all around us, we slowly float up to 1,505 meters of altitude - the highest lift-operated point in the future bike park. 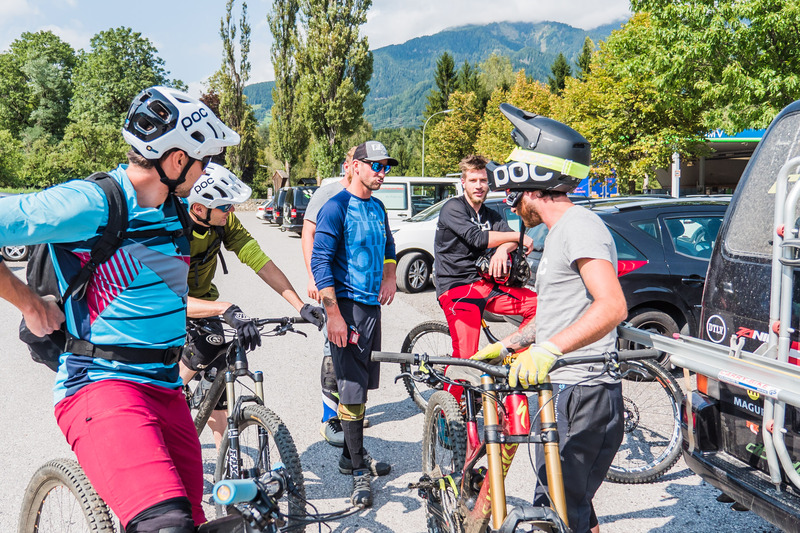 With muscle power, especially the ever-growing number of enduro bikers, who have a hard time finding training opportunities in our domestic region, but also all-mountain riders, will be able to experience an even bigger playground. A wide fire road takes you up another 340 meters in altitude towards the Hochstein. Heading down on natural trails eliminates that distance in no time. 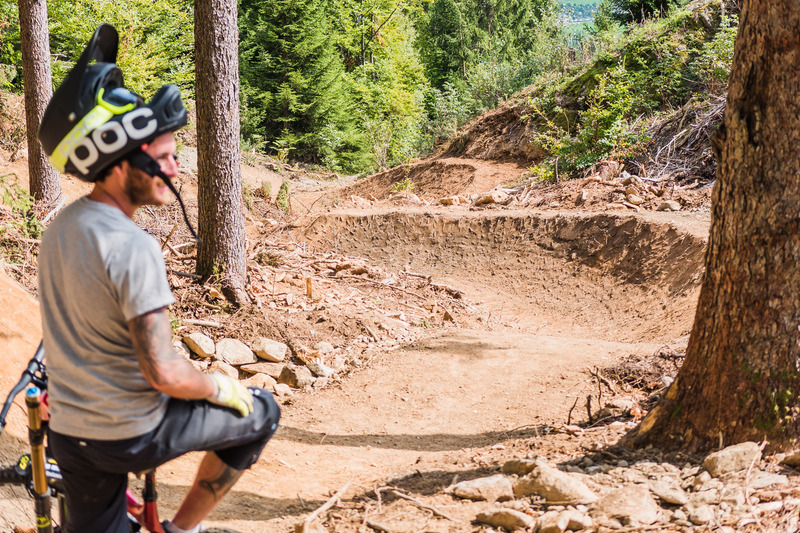 The exact routing of the trails is yet to be negotiated, but you'll be looking at various options for a fun day in the bike park with multiple ups and downs. In total, so the plan, five trails are to be included on the Hochstein. Apart from the Lakata-Trail, two more shall lead down from the Sternalm. In 2018, an easy blue variant and a more challenging red descent will be realized. 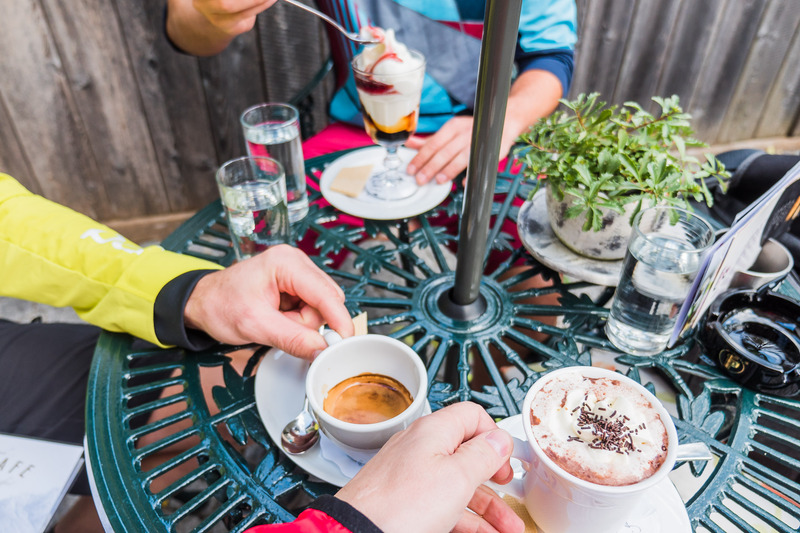 As we get back down to the Moosalm along the - not only for hardtails - challenging Dolomitenmann descent, sun, terrace and gusto for sweets are calling for a break. 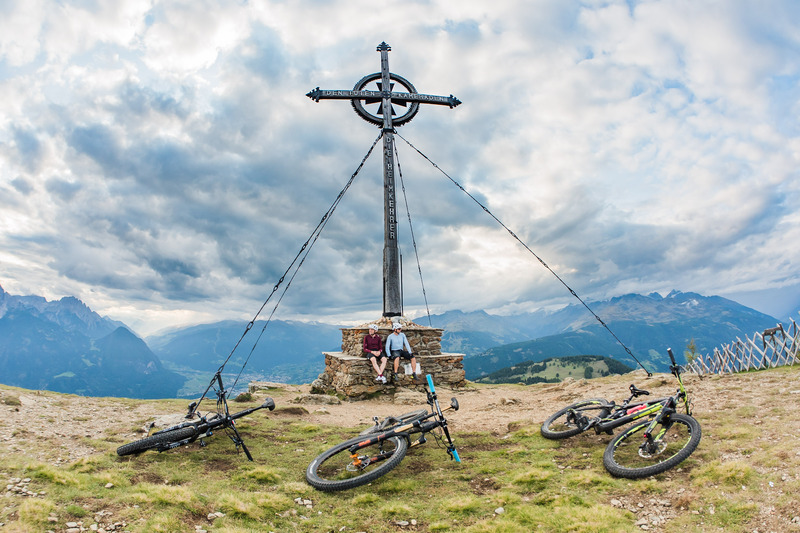 Once everything is up and running and combining the planned Hochstein- and Sternalmtrail with the Moosalmtrail, the total descending elevation adds up to a 1000 meters. 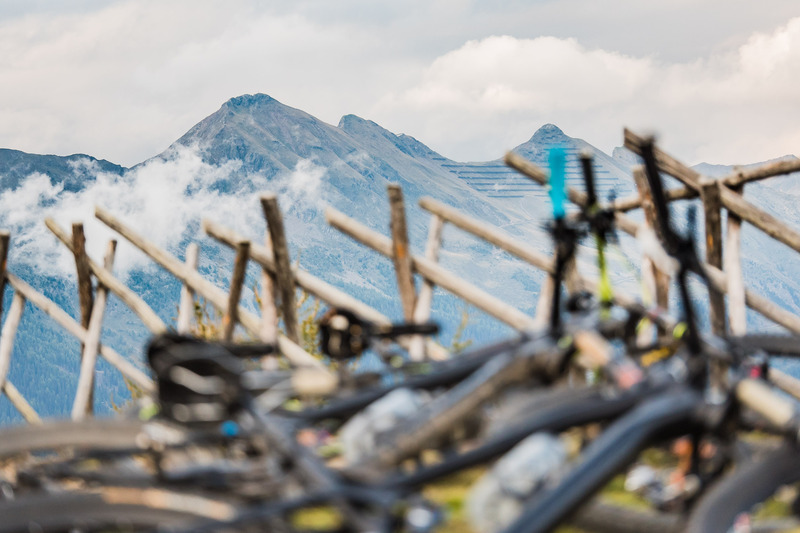 First natural technical terrain, then typical flowing bike park routes are a winning combination. While we were only able to guess most of where the trail is supposed to run down to the Moosalm, a few meters after the alp and not far from the middle station we are already rolling on hardened paths into the forest. 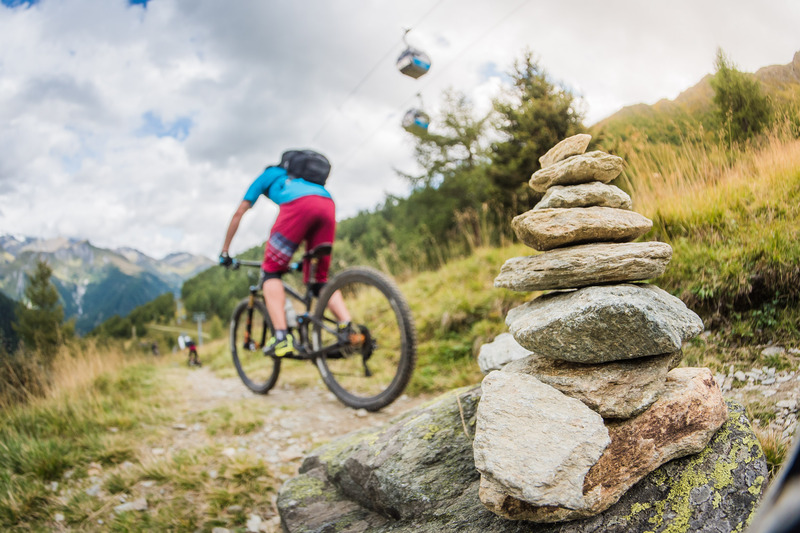 The Lakata-Trail has a mellow beginning, with small rollers inviting to pump the bike. Shortly before the first berm combination, Renè comes to a stop. He eagerly declares that this will be the first real maiden run for him as well. Did they pick all the radii correctly? The approving nod from our Canada-calibrated photographer after the first section would suggest so. 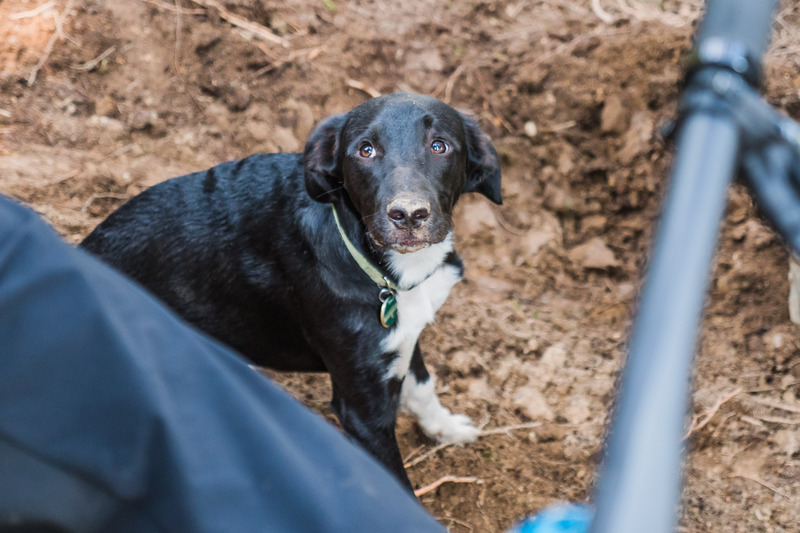 In order to deliver a wide selection of variety, two trail building companies were hired. 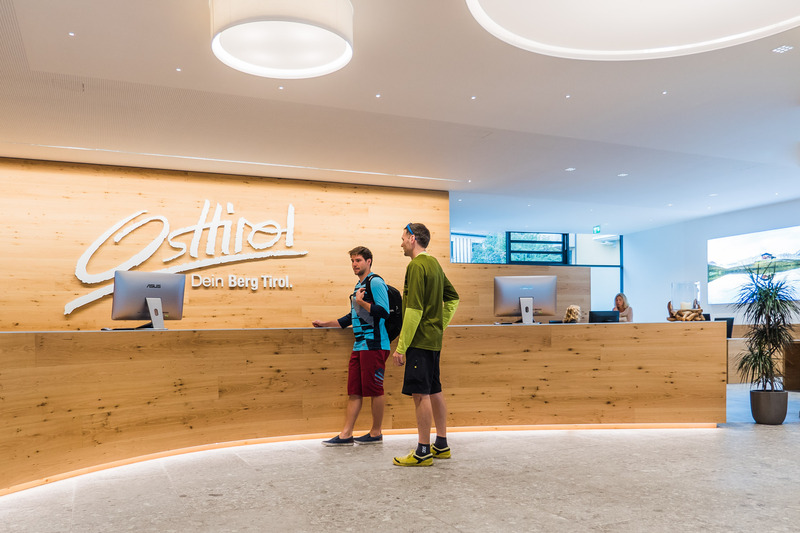 With their roots in Canada and residence in Innsbruck, Trailtec's team has left their shovel marks in Serfaus, Nauders, Sölden and the Muttereralm. 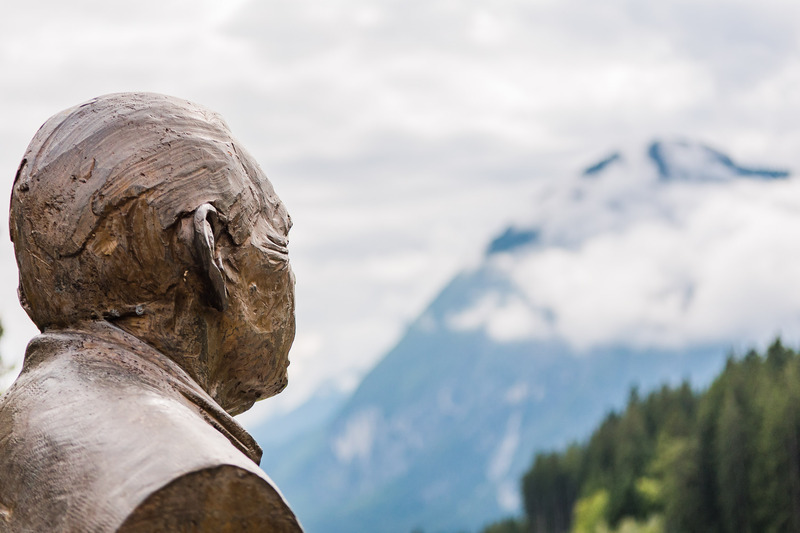 Alpreif, on the other hand, is responsible for the parks in Schladming and Wagrain these days. 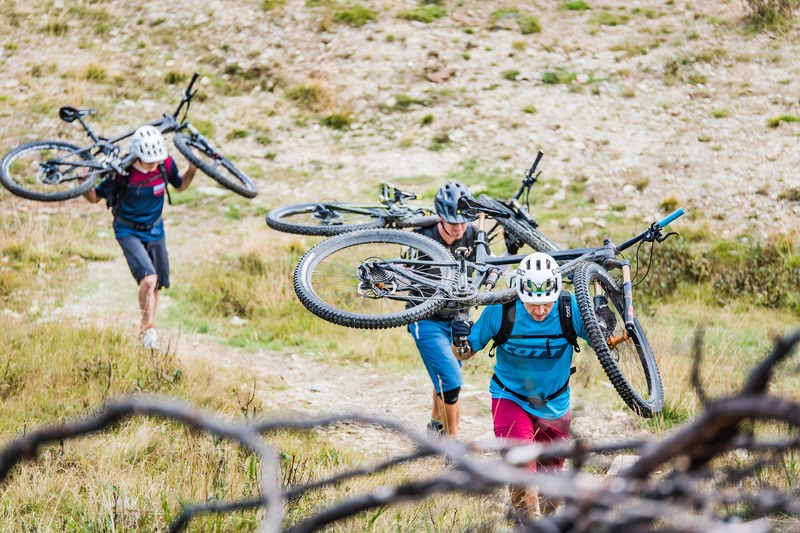 As soon as the ground beneath our treads is getting softer rapidly, we get off our bikes and push. Meanwhile, the city of Lienz keeps popping up behind the trees, as we reach the small excavator and hardworking operator. Since the line will be the only official riding option at its point of completion and for the time being, its character is intended to cater to as many riding levels as possible. No one should get bored, but beginners have to be able to rush down to the valley with their friends safely. it's a balancing act, but the knowledgeable teams know how to pick the lines. 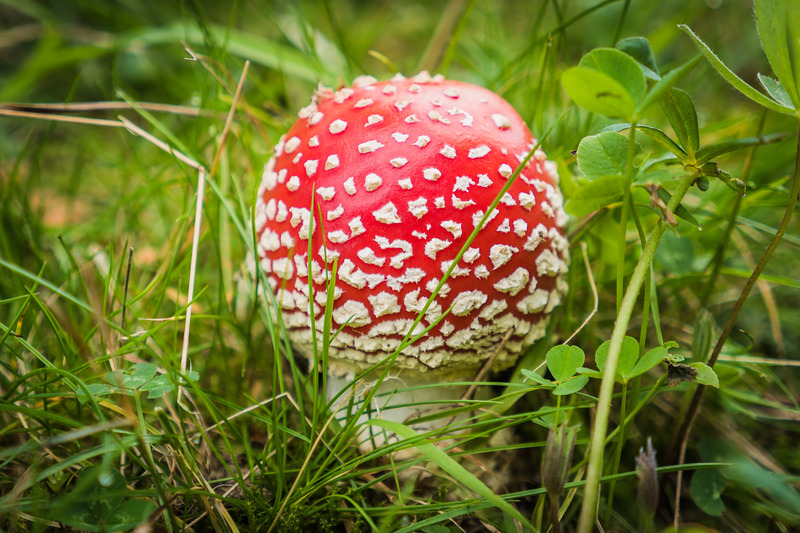 As soon as more trail options are realized, a stronger level of differentiation is planned. An otherwise insurmountable giant rock face in the lower part is being equipped with a wooden ramp. 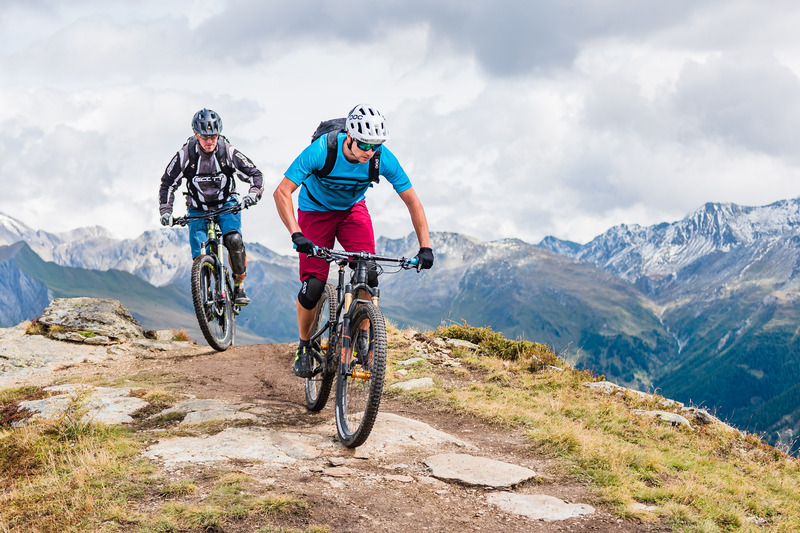 The rest of the trail is free of artificial constructions except for some ride- and jumpable rollers, berms and grippy soil with a bit more than 300 cumulative meters of elevation loss, directly at the doorstep of the city. EDIT: In the meantime, both World Champions Alban Lakata and Peter Sagan have inaugurated the trail. Construction work is still underway, though. As soon as the trail is open to the public, tickets (day tickets, 4-hour half-day tickets and single rides) are available at the ticket booth of the valley station Hochstein. Day ticket including bike transport: €21,-. 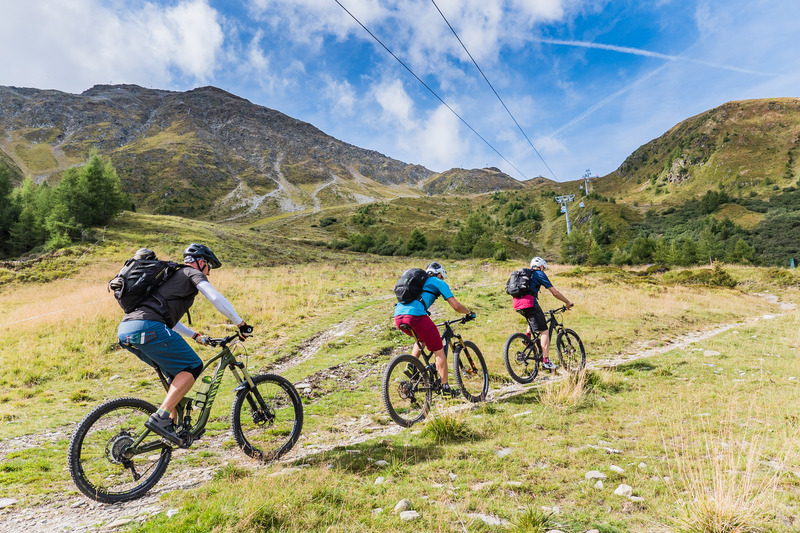 4-hour half-day ticket including bike transport: €16,-. 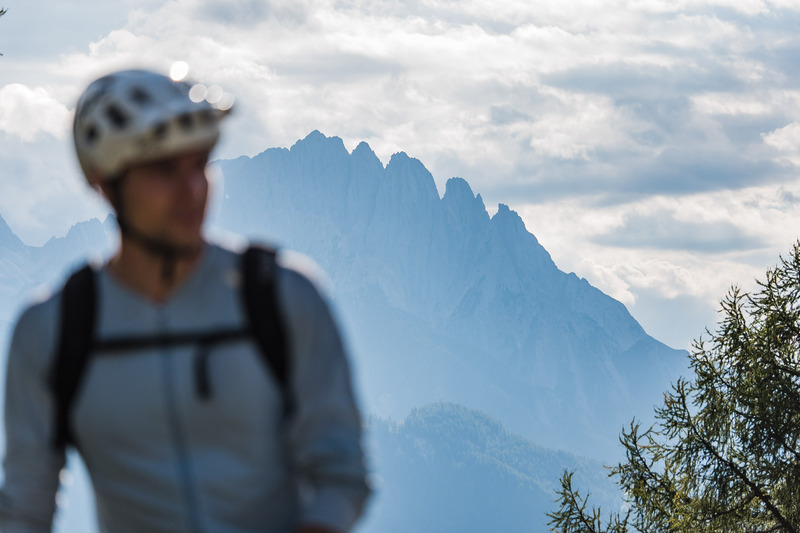 The Lakata-Trail will be open until the first snowfall, in minimum until the end of October! Free parking is available directly at the valley station. 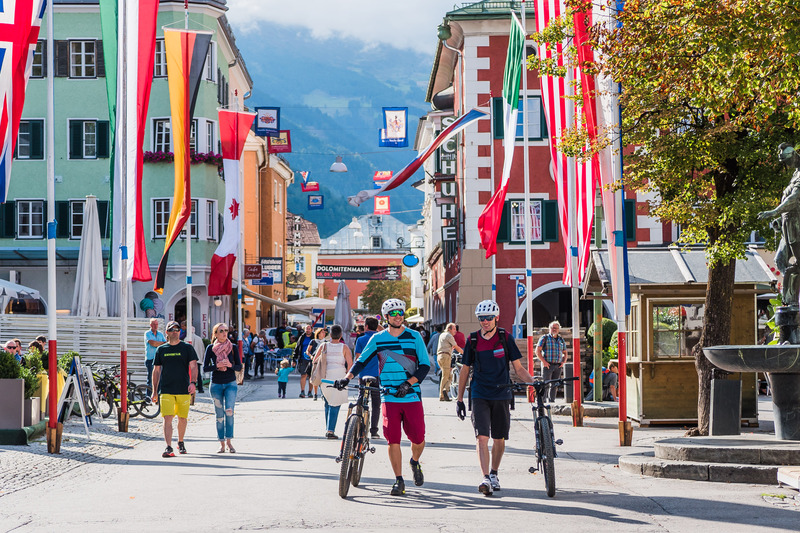 Pondering about our on-site inspection, we push our bikes over Lienz' charming middle-aged main square a little later. 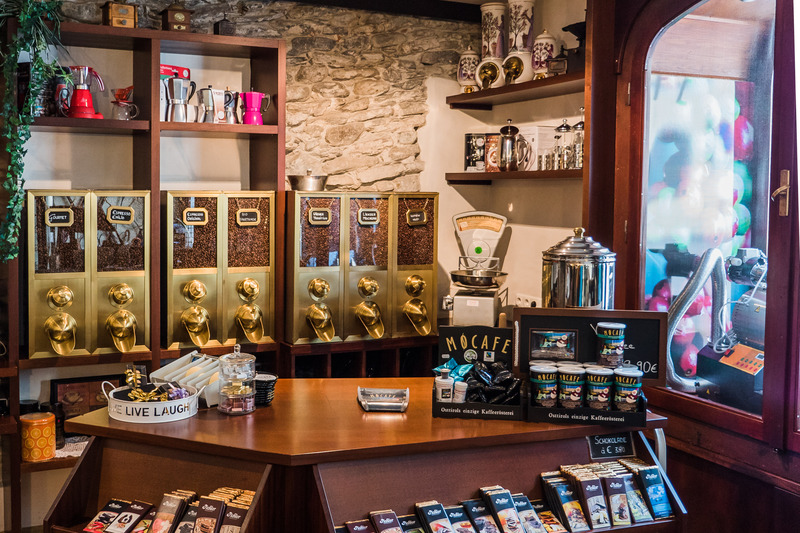 If you were looking for a coffee, it would be easy to strike it rich here. However, we are pulled beyond the city walls and across the Isel. 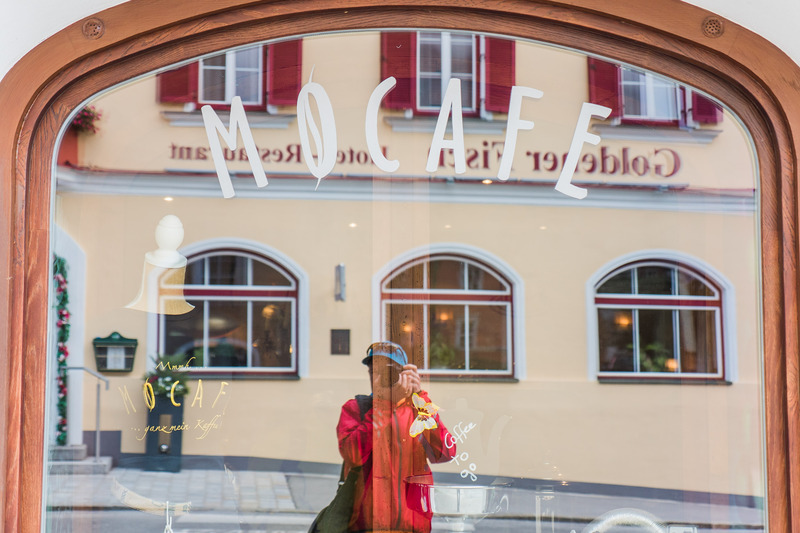 At the fabulous terrace of the Mocaffees - East Tyrol's only coffee roaster - you can relax superbly at the waterside. 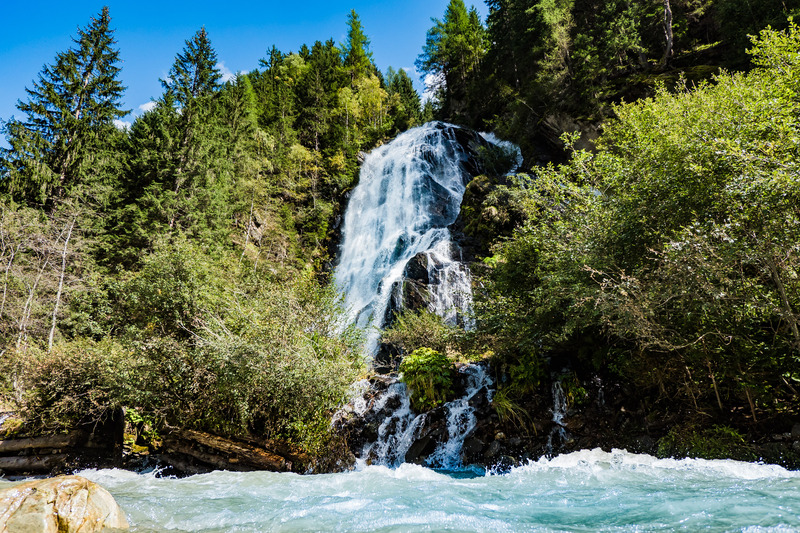 Here, where the water of the Isel pushes against the kayaks, it soon enters the Drau and leaves the valley to the East in the same direction as we are. 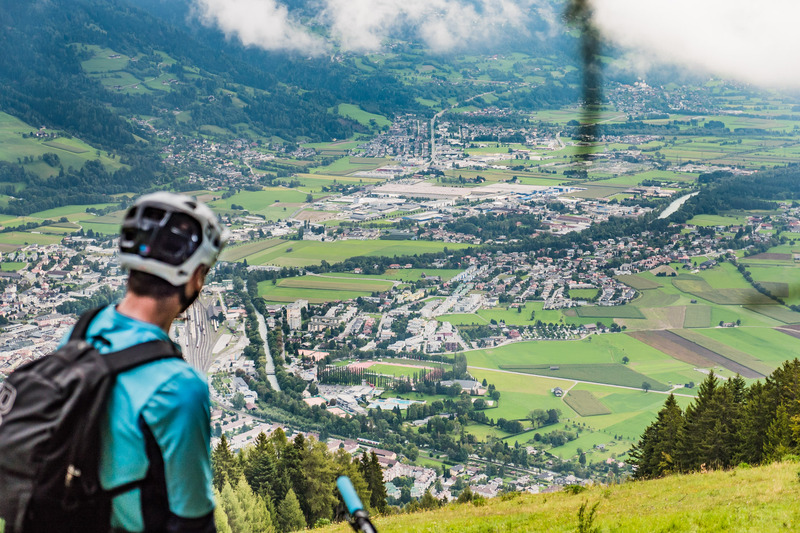 In and around Lienz a lot is happening for us mountain bikers. 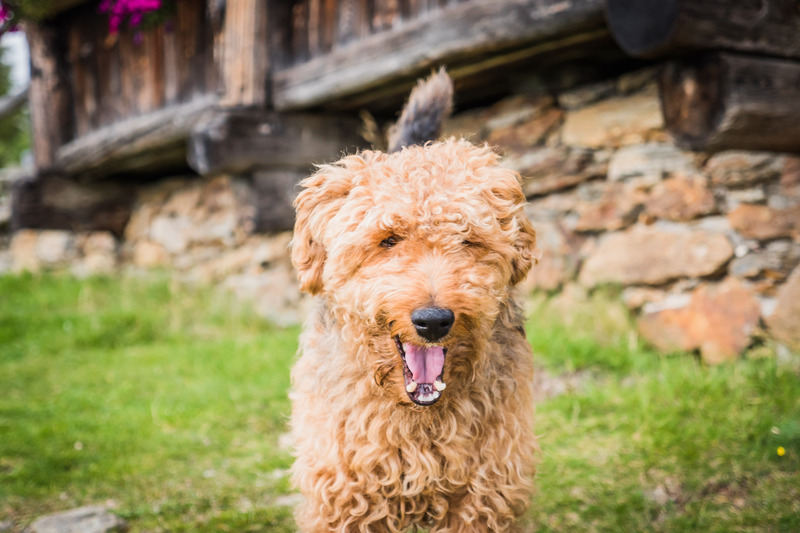 We will keep you posted - in case you haven't explored the Eastern Tyrolean mountains yourself by then. 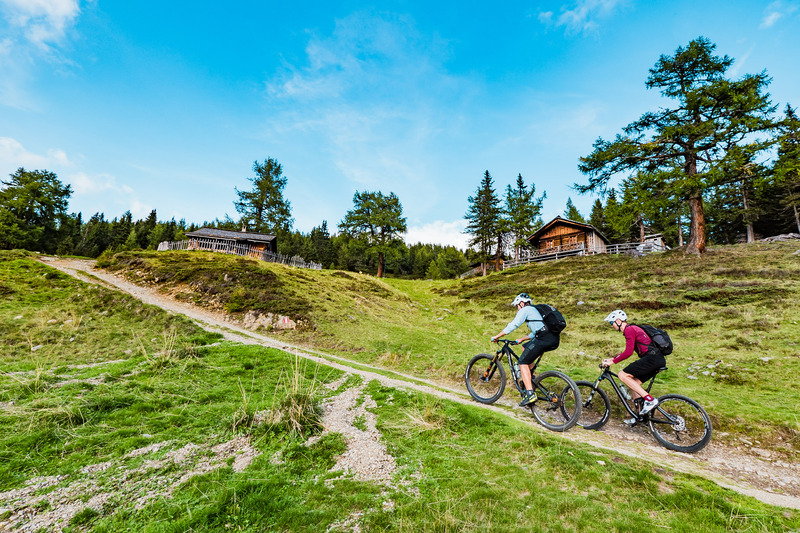 The Four Huts Tour encircles the city of Lienz counter-clockwise across the foothills of the Schober group, Deffregger Alps and Lienzer Dolomites. 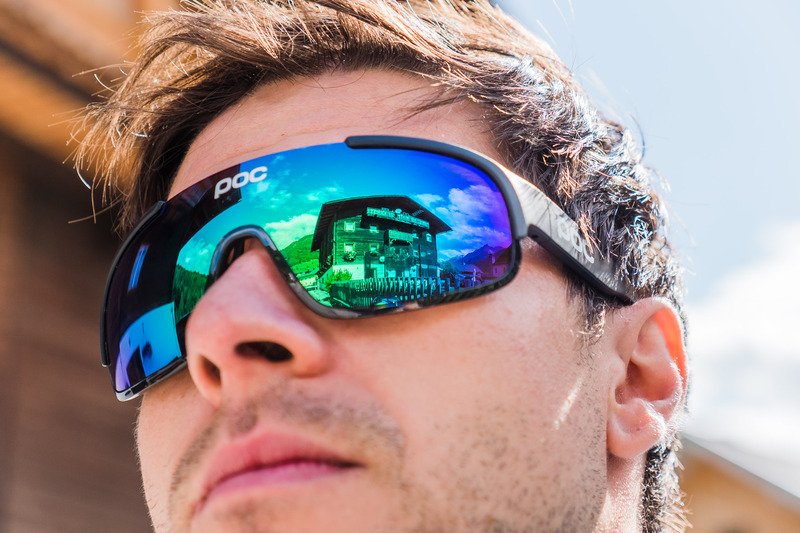 112 kilometers and 5,350 meters in altitude are spread over four day stages with an overnight stay at each hut. More at maps.osttirol.com. 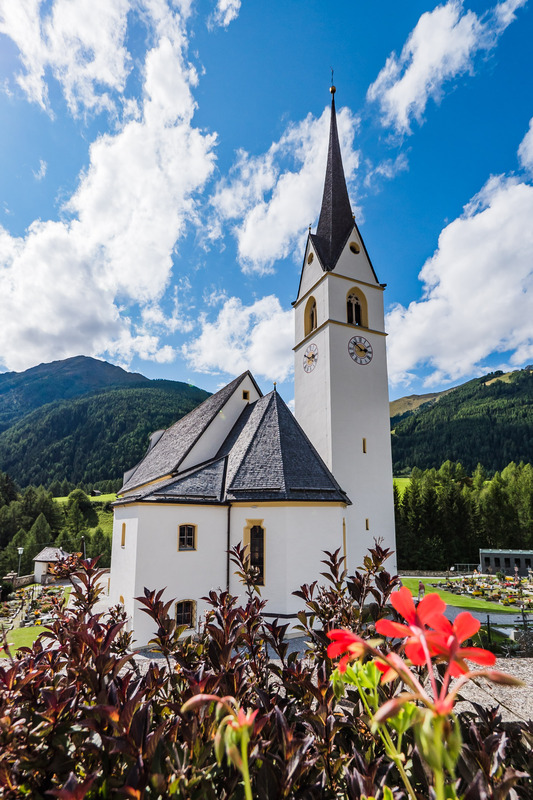 In Kals at the Grossglockner there are many alpine paths and roads leading through gorgeous landscapes - from mellow excursions for the entire family to challenging day trips with carrying passages and opportunities to stay overnight. 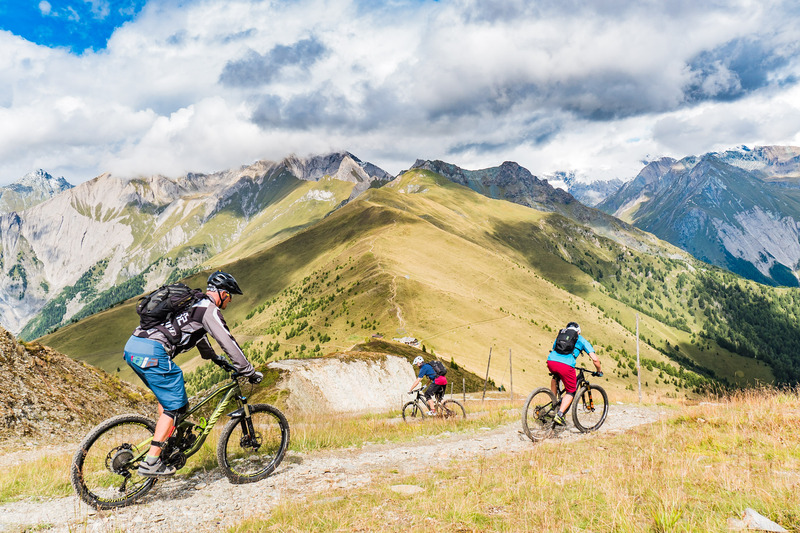 The developing singletrail network is accessible by fire roads or via gondola. 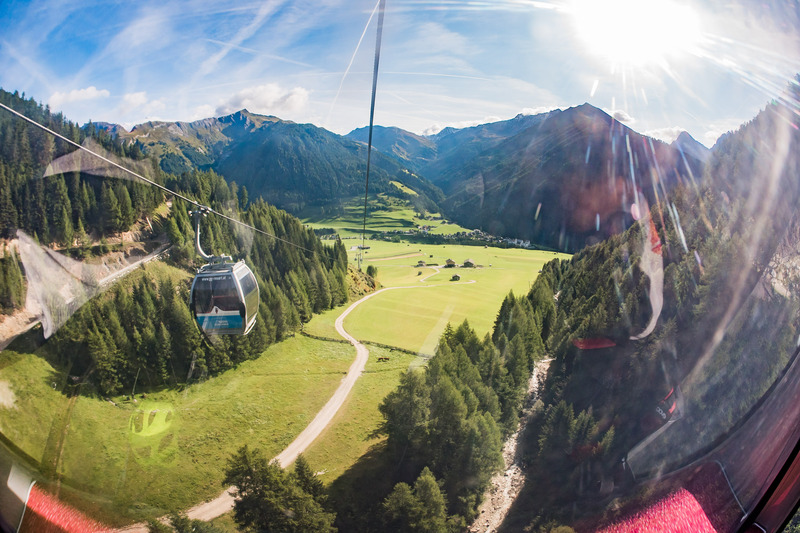 The gondola Kals at the Grossglockner is closing down its summer operation on the 24th of September - prices and lift operation times for the 2018 season are updated at www.gg-resort.at aktualisiert. 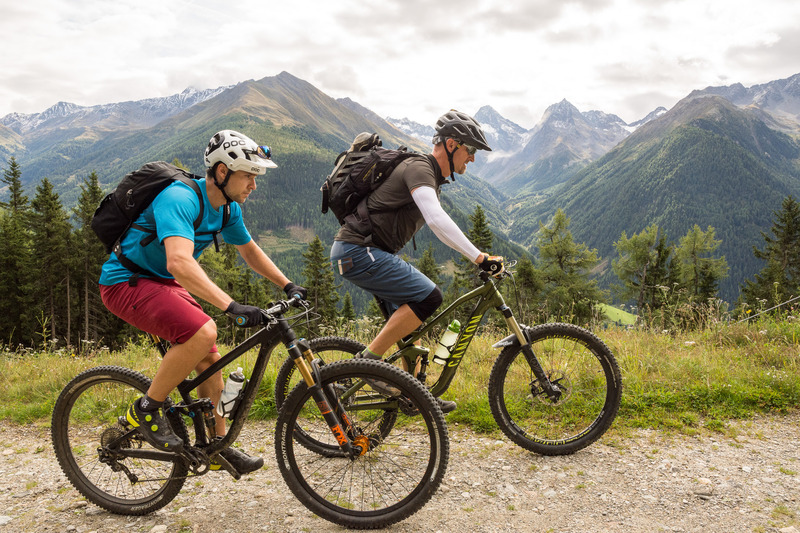 All mountain bike routes are marked and signposted, further information is available at the tourist information Kals am Grossglockner Tel. 0043 (0)50 212 540. Guiding und skills training with Glockner Adventures. 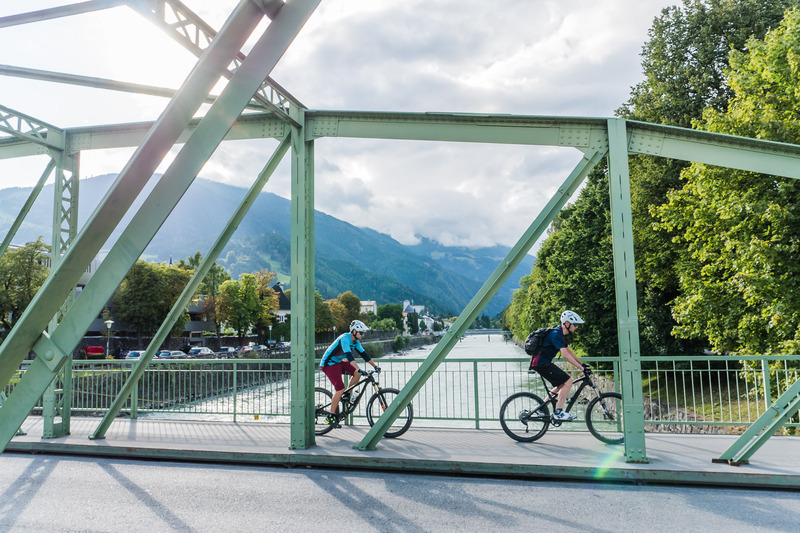 Bike transport for single bikes - for example from Lienz up to Kals - is an option. Unfortunately, the bus driver has to decide if there is enough room for transportation, depending on the amount of passengers at the time. 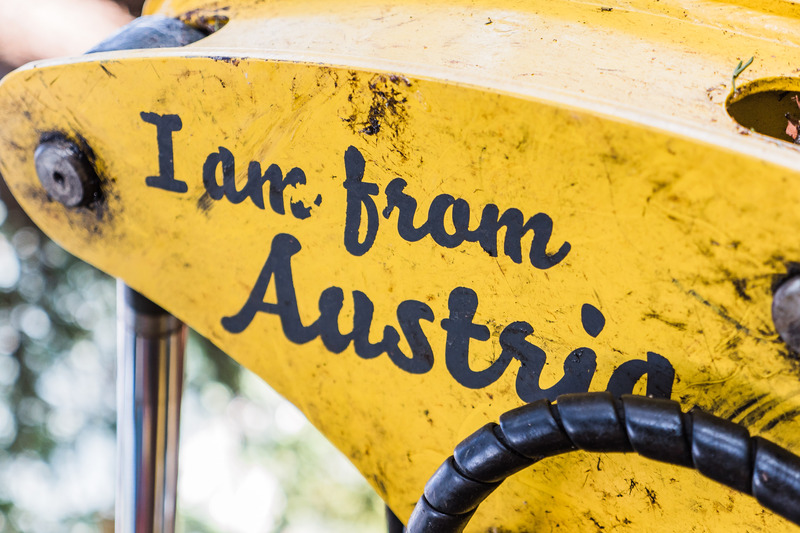 It's best to call in at 04852 6494515 with Postbus Lienz to check for an arrangement. Starting with December 2017, every guest with a guest card can use the bus for free. 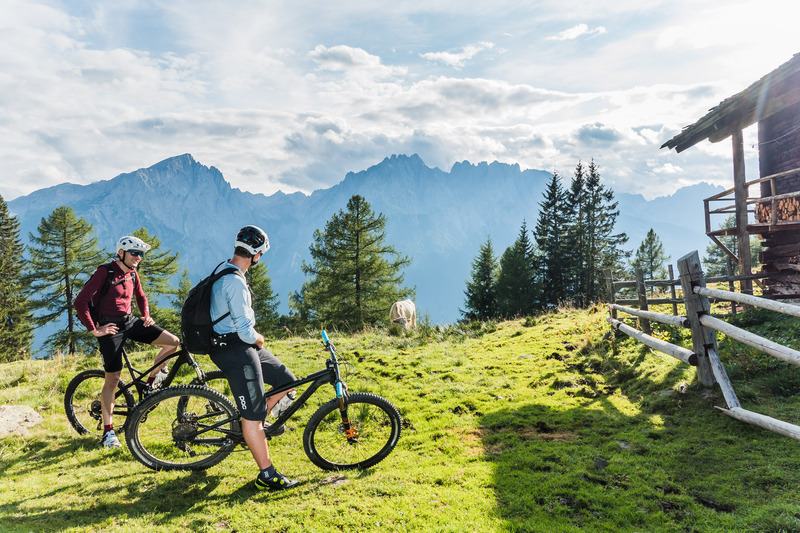 Lienz: Probike Lienz, rental and shop, Dolomite Bike, starting with the 2018 season also rental at the valley station of the Hochsteinbahn. Kals: Sport Gratz, right at the valley station of the Kalser lifts.